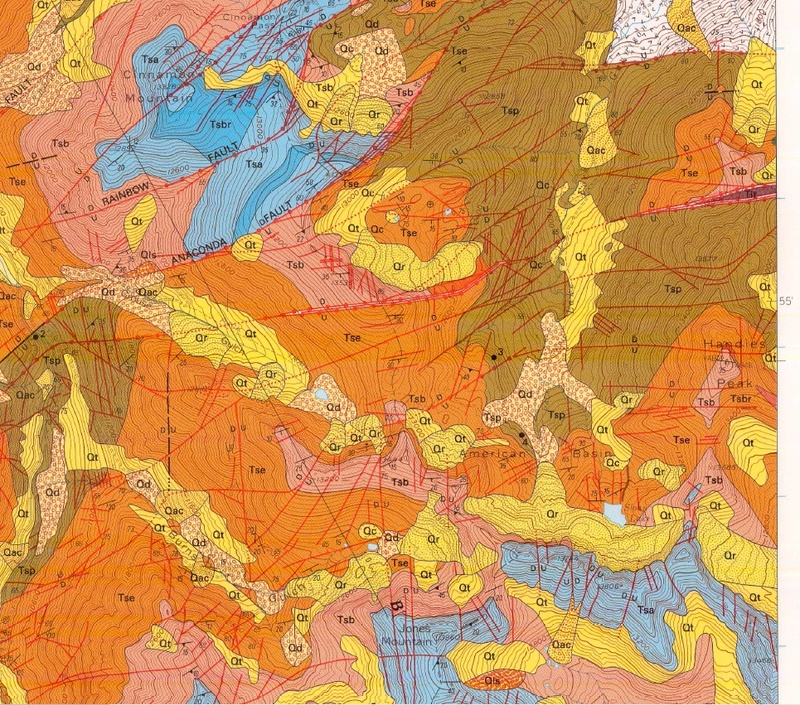 Beneath all the wealth of detail in a geological map lies an elegant, orderly simplicity — J. Tuzo Wilson, Scottish Canadian geophysicist that laid much of the framework for modern Plate Tectonics. Sunrise in the Hengladir Valley, near Hengill Volcano, Iceland. Running with Michelle and looking at a boiling hot spring. Elísabet Margeirsdóttir photograph. Click on any figure to make it full sized. 4.5 billion years is a long time — even for a geoscientist. The age of the Earth is known with remarkable precision (the error in age is less that +/- 1 percent), thanks to radiometric dating of Earth and Moon igneous rocks and meteorites from other parts of the solar system. The Earth has been an evolving planet for about one third of the existence of the universe; despite this “old age”, the planet is a dynamic and HOT planet. The heat flow from the Earth’s interior is a little less than 50 terawatts, which drives the constant reshaping of the surface — raising mountains, erupting volcanoes and causing earthquakes. The source of this geothermal energy is fairly well understood, and is due to the decay of radioactive elements and primordial heat (the heat left over from the original formation of the planet). However, how the heat is transferred from the Earth’s interior to the surface is less well understood. The details of the heat transfer matters — it is the driver of plate tectonics. In the early part of the 19th Century Charles Lyell, a great British geologist, proposed that the Earth had to be at least 300 million years old based on the slow rates of geologic processes. This ancient age for the planet not only infuriated the religious order of the day, but it annoyed the growing global physics community because it was based on speculation and logic arguments instead of models and calculations. Lord Kelvin expressed this contempt simply: “When you measure what you are speaking about and express it in numbers, you know something about it, but when you cannot express it in numbers your knowledge about is of a meagre and unsatisfactory kind.” Kelvin went on to calculate the age of the Earth assuming cooling through conduction, and arrived at an age of between 20 and 90 million years. I used to assign this problem as homework in my course on mathematical methods in geophysics. The calculation is straightforward and stunningly incorrect. Kelvin’s calculation had almost nothing to do with the Earth’s heat flow – it had the wrong heat transport model by ignoring convention and did not account for continuing heat production through radioactive decay. In 1919 Arthur Holmes — another great British geologist — suggested that the high temperatures in the Earth’s interior meant that rocks could “flow” in convection, and mass movement was the primary mechanism for moving heat from the deep interior to the surface. Arthur Holmes used his idea of convection in the mantle of the Earth to propose a mechanism to drive plate tectonics in 1928. It took another 30 years before the Earth science community began to understand it as the unifying theory in geology. It took another 30 years before a later generation of geophysicists took Holmes ideas and connected them with observations of ocean bathymetry, volcanic chemistry, and the geography of earthquakes to understand Plate Tectonics. However, there were some still some very odd observations that defied explanation with the plate tectonics paradigm. One of these was the idea of “hot spots” – large volcanic complexes that seemed to be located totally independent of plate tectonics. J. Tuzo Wilson — a Canadian geophysicist — showed that Hawaii was a long chain of volcanic islands that could be explained as a “hot spot” that melted the overlying plate as it passed by on its path determined by the driving forces of plate tectonics. The nature of these hot spots was a subject to great debate (during my graduate school career it was the regular topic of daily coffee discussions), with most scientists believing that they were thin columns of hot mantle that came from depths near the Earth’s core. Today, the concept of “thin” plumes is largely rejected in favor of broad convection plumes. There is one place on Earth where a hot spot and a mid-ocean ridge coexist – Iceland. This is a truly strange and marvelous place. The hotspot has created an island about 1/3 the size of New Mexico; the center of the island is constantly being pulled apart as the mid-Atlantic ridge grows and the North America plate moves away from Eurasia at a rate of about 2 cm per year. Geologic Map of Iceland. The “pink” zones show the recent volcanic activity that includes both the spreading center that travels across iceland through the Reykjavik Peninsula in the southeast to Husavik in the north as well as the center of the hotspot. I have always wanted to visit Iceland and see with my own eyes the most impressive expression of the Earth’s heat engine. The physical location of Iceland — centered about 66 degrees north latitude — adds an extra wrinkle to the heat. 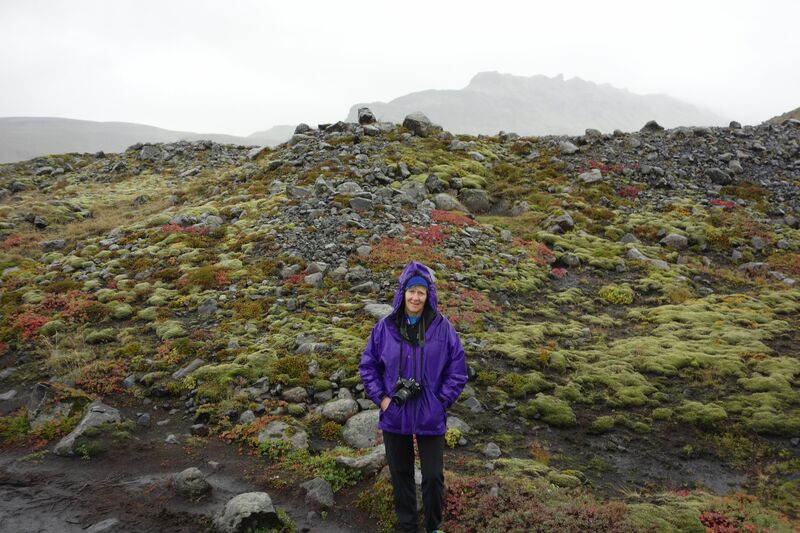 The climate demands snow and ice…the geology demands volcanoes and lava flows. 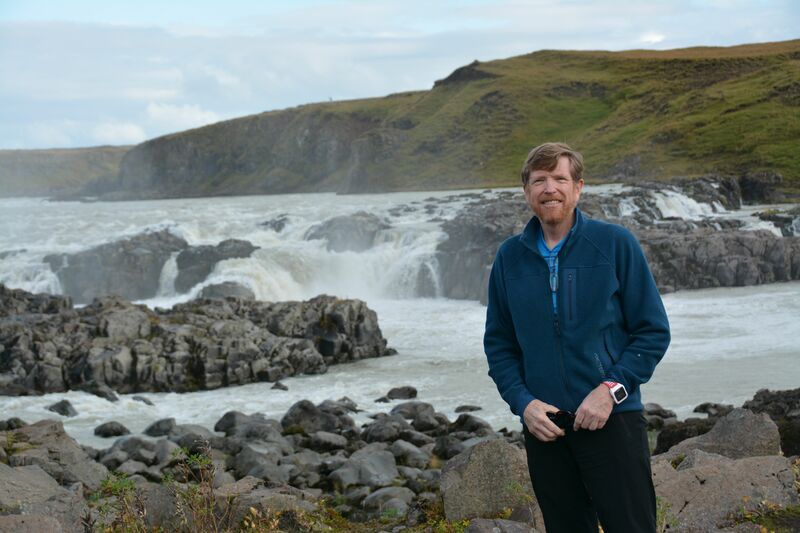 Finally the opportunity arrived to visit Iceland arose, and I planned to run from North America to Eurasia, and from glaciers to geysers. Map of southwest Iceland, and the locations of our various runs, treks and geology visits. I planned a late September trip to Iceland, and arranged to see the geology the only way it is meant to be seen — underfoot. 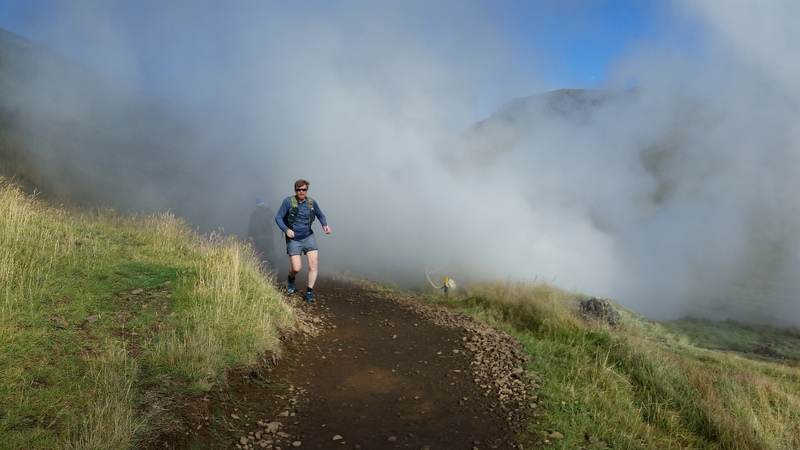 I had the fantasy of the ultimate trail run; running from one major tectonic plate to another. The mid-Atlantic ridge comes ashore in Iceland along the Reykjavik Peninsula (see the geologic map above), and the splits the island from north-to-south. The plate boundary is not a single, simple fault. It is more diffuse; however, geodetic measures clearly delineate that it is possible to run from North America to Eurasia with a good geology map. About 25 miles east of Reykjavik sits Hengill Volcano. Modest by volcanic measures, Hengill is a row of craters aligned along a NNE trend, and has erupted material that now covers about 100 km2. The last eruption was about 2000 year before the present, but today is a major source of geothermal electrical production. The climb up the volcano offers wonderful views even though its maximum elevation is only 2200 ft.
We (my wife and I) planned a run from the west side of Hengill, up towards the summit craters, and then down Reykjadalur Valley, which is also known as the Smokey Valley due to its large number of fumaroles. We used a running tour guide from Arctic Running (Elísabet Margeirsdóttir) to lead us over the 10.5 miles of very varied terrain. 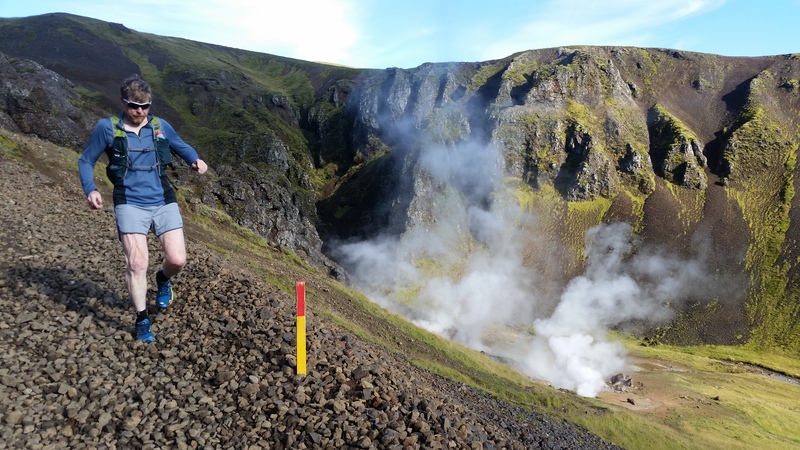 Running on the flank of Hengill Volcano. This rocky hills are called “borgs”. 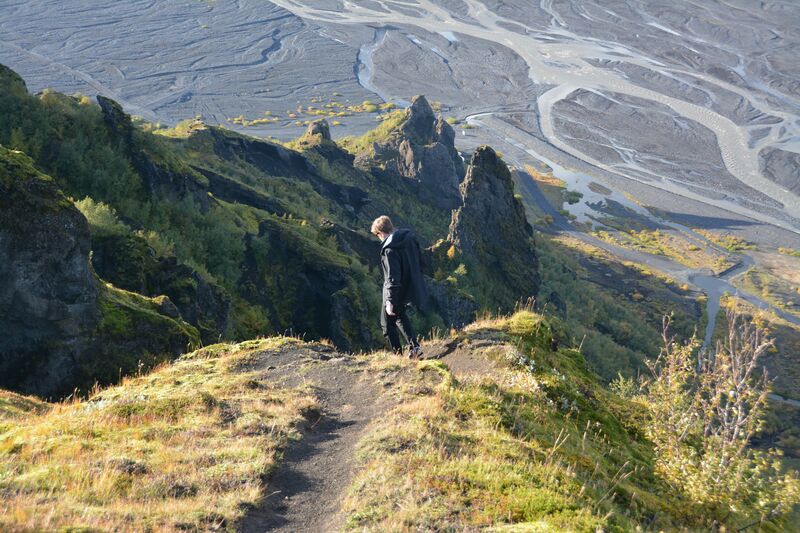 After a brief climb up the flank of Hengill, the run is across a moonscape of cinders and volcanic bombs and cobbles. The run is challenging because of the surprises in footing, but is mostly slow paced because there is so much to see. After about 6 miles the trail crosses a pass that allows a view 40 km to the north. Smackdab in the middle of the Mid-Atlantic Rift – North America to the left of the photo, Eurasia to the right. 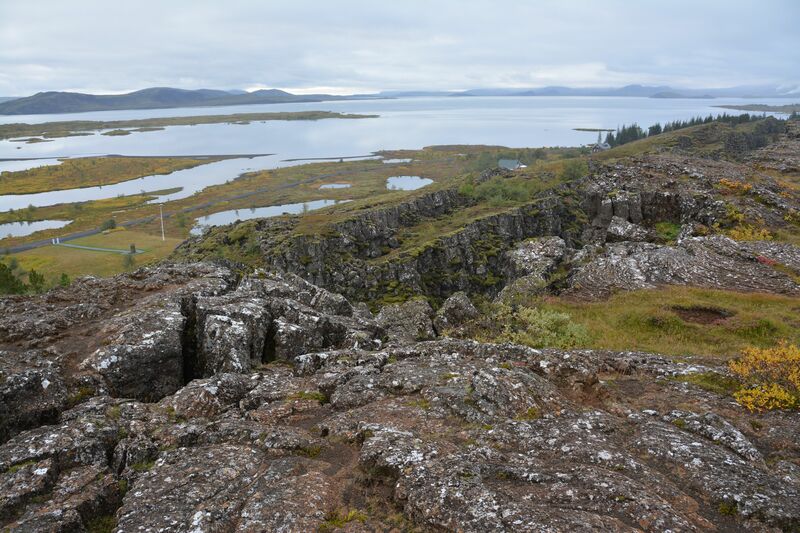 In the distance is the large lake Þingvallavatn, which is in the rift valley (usually marked on maps for the culture center Thingvellir). In the distance is Þingvallavatn, the largest lake in Iceland. This lake is located within the rift valley separating the plates. On another day we visited the lake and the numerous basalt flows and dozens of grabens. Þingvallavatn and the rift valley. There are numerous fissures in the basalt that are expressions of dozens of pull-apart grabbens. These grabens are an markers of the plate boundaries. However, despite the advertisements that you can “stand on both plates”, the boundary is more diffuse – probably 2-5 miles across. The view is to the southeast, and on the horizon is Volcano Hengill, source of the previous pictures. Þingvallavatn is partially within Þingvallir National Park, which is quite popular with the tourists. The original Icelandic Parliament was established here in 930 (about 60 years after Norsemen arrived on the Island), and remained here until the beginning of the 19th Century. Despite the crowds, a short hike will allow one to explore the geology in relative solitude. Another graben at Þingvallavatn. The sides of the grabben form the channel for a river. 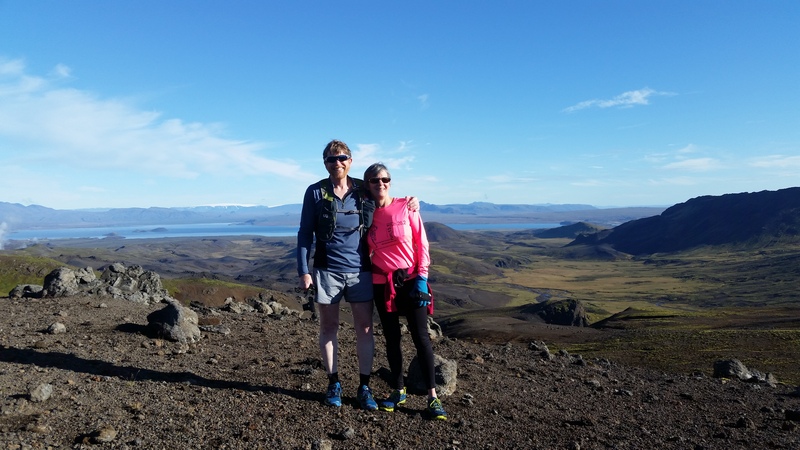 The trail run turns to the south from the pass on the flanks of Hengill and enters Reykjadalur. Every hillside is alive with fumaroles – the mountains are literally smoking. At about mile 8 the warm waters of the all the springs drain into a modest river which runs along a short plain. The river here is famous for bathing, and indeed we stopped and soaked a bit before running on to the end of the trail. The water in the various natural pools is about 100 degrees – a warm bath. 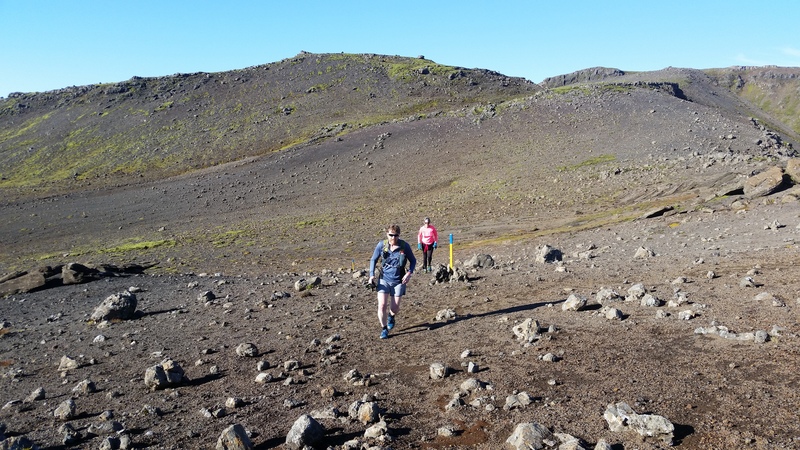 Running down hard scoria into Reykjadalur – The Smokey Valley. The final part of the run has a challenge that is unlike any I have faced. There are two spots that have warning signs advising hikers not to breath in the milky clouds coming from some of the springs. The warning talks of health hazards – and it clearly related to the release of H2S. A special hazard of running the lower Smokey Valley – clouds of steam that are rich is H2S. Signs warn to hold your breath….really. At the first of the these warning I attempted to hold my breath, but clearly I was not running fast enough, and had to take a deep gulp of air right in the middle of the cloud. The rotten egg smell is enough to cause one to knell over, but the total exposure is pretty limited. 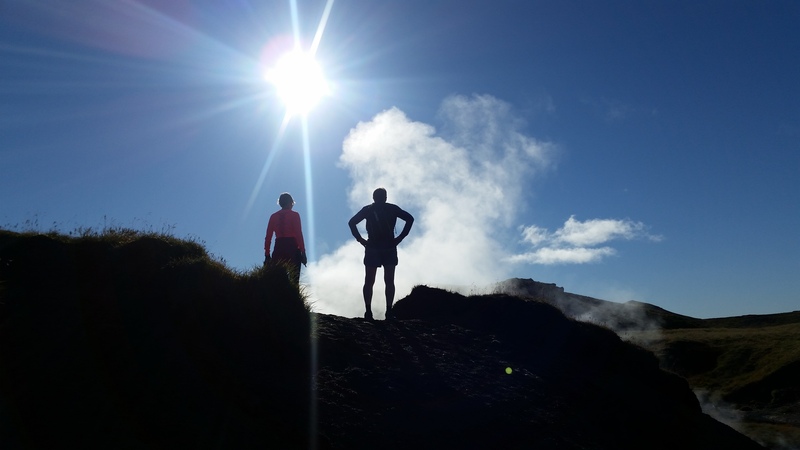 Kerið crater — just beyond the completion of the Smokey Valley trail run. A 3000 year old scoria crater filled with water. A short distance beyond the end of the trail run is a series of “cinder cones” that have erupted in the last few hundred years. 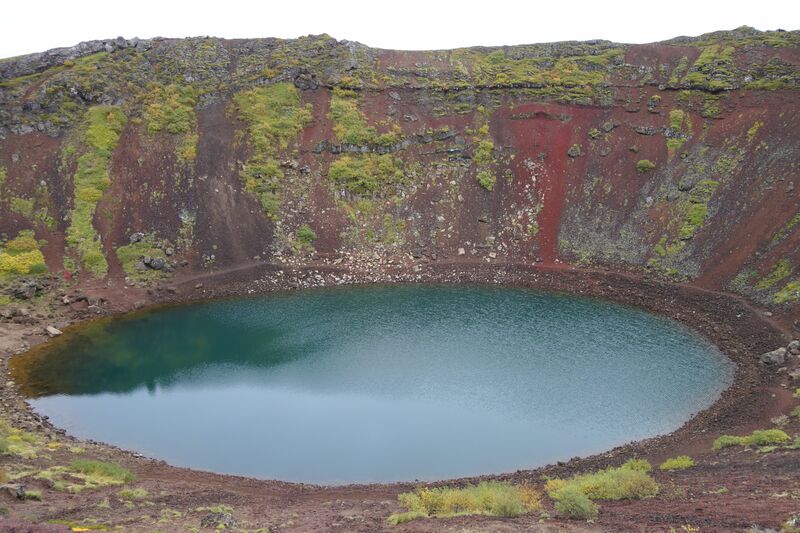 The best preserved of these is Kerið crater, which is filled with a deep blue lake. The contrast in colors – the red of the scoria and the blue of the lake make for a striking geologic panorama. Glacier on mountains mean flowing water everywhere. Starting up the the washout plains to Thorsmork, and one of the scenic waterfalls. A short jog across the plate boundaries serves only as a reminder that the geology of Iceland is immense! The Hengill area is dominated by the dynamics of the spreading center. Further to the east are a series of very large volcanic complexes – not really volcanoes, but a series of vents and craters that have a strong fingerprint of the deeper mantle chemistry indicative of the Iceland hotspot. Glacial outwash on the road to Thorsmörk. On the horizon is another volcano, Tindfjallajokull. Only a few 10s of miles east of Hengill sits the most famous Iceland volcano, Hekla. Hekla is a stratavolcano that is about 4900 ft in elevation, and has had 20 significant eruptions since the first occupation of Iceland. There are numerous deposits in Ireland and Scotland of tephra from Hekla eruptions. A large eruption conjured a vision of hell, and a monk wrote: “The renowned fiery cauldron of Sicily which men call Hell’s chimney … that cauldron is affirmed to be like a small furnace compared to this enormous inferno”. Hekla is one of only two Icelandic words that made it into common English language. “Heck” is a shortened version of Hekla, and “what the heck” literally means “what the hell”. 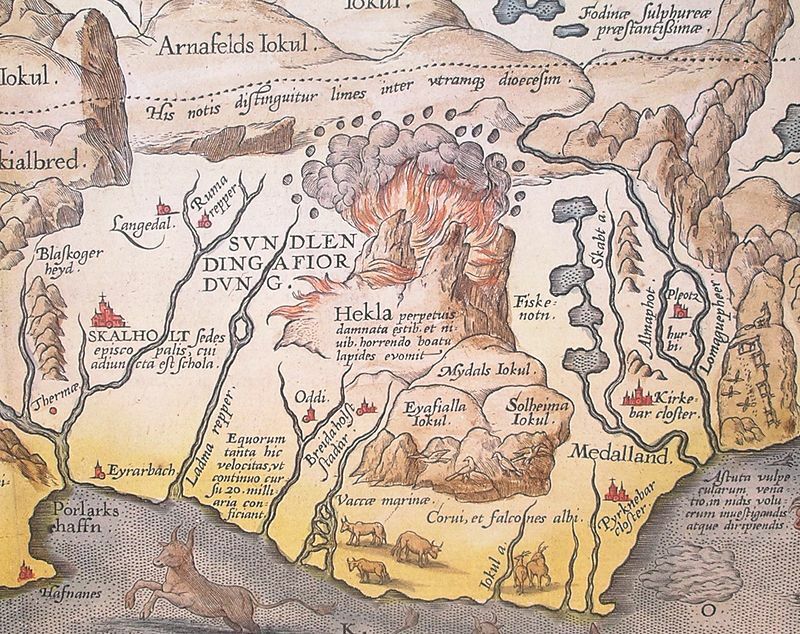 Abraham Ortelius’ 1585 map of Iceland showing Hekla in eruption. The text translates as “The Hekla, perpetually condemned to storms and snow, vomits stones under terrible noise”. A few miles southeast of Helka is one of the treasures of Iceland, Thorsmörk (Thor’s Valley). 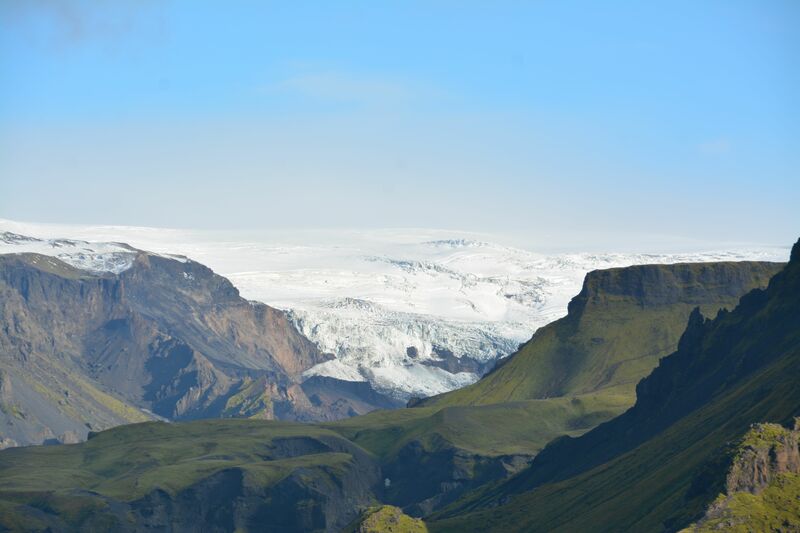 This valley is bounded by glaciers to the north and south (Tindfjallajokull and Eyjafjallajökull respectively), and blocked by a third major glacier, Myrdalsjokull in the east. I planned to hike between the Eyjafjallajökull and Myrdalsjokull glaciers (adding the word glacier is redundant since jokull means glacier, but Icelandic words are very difficult!) through a pass known as Fimmvörðuháls. The second part of my jog across Iceland was trek on the edges of the hotspot. 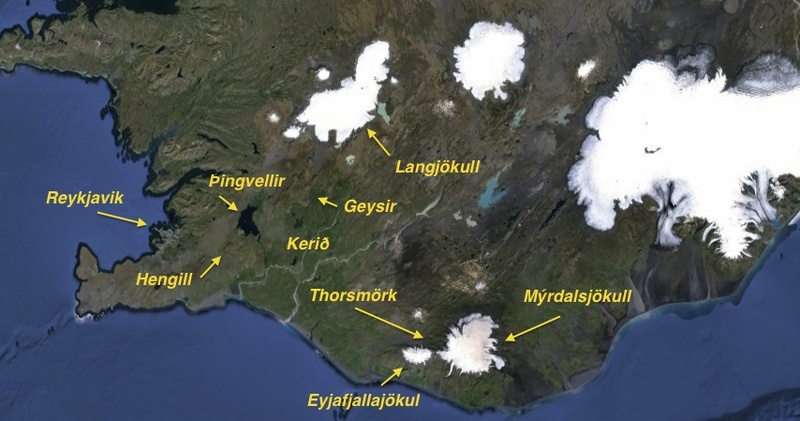 The beginning of the trek – Thorsmörk, looking up at the glaciers of Myrdalsjokull and across the wide plain of a flood basin and the river Krossa. The Myrdalsjokull glacier sits atop the Katla volcanic complex – one of the largest in Iceland. 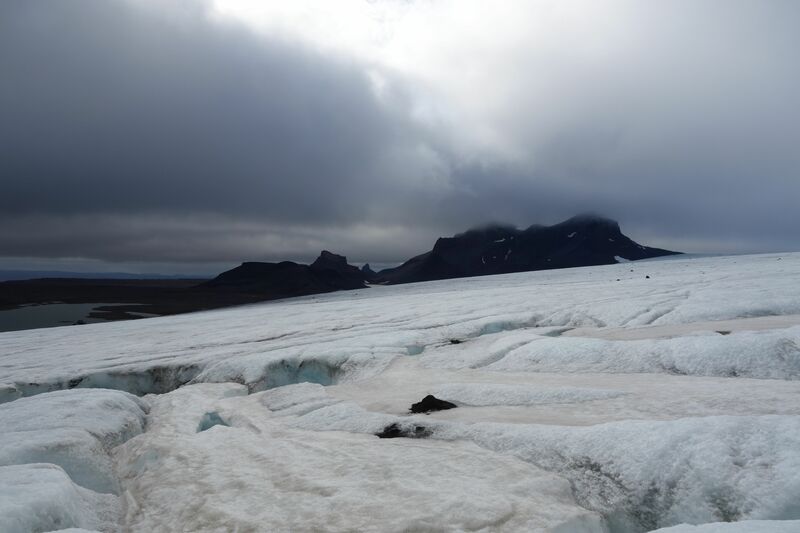 We hired a ride to the Thorsmörk, and hoped for about 35 km of walking. Along the way we visited one of the small valley glaciers that connects to Eyjafjallajökull, Gigjokull. 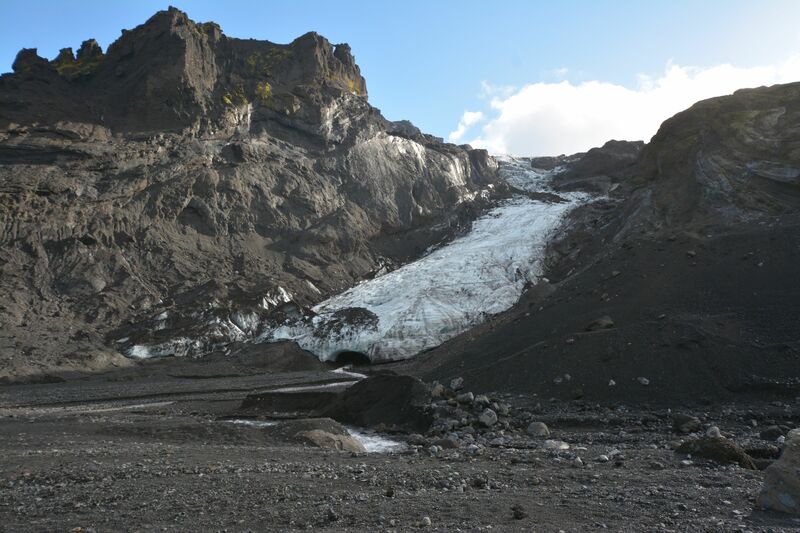 Eyjafjalla erupted in 2010, and caused significant ice melting that caused Gigjokull to surge, and released a great outwash of debris destroying the jökulurð (terminal moraine). Gigjokull glacier; The toe is about 50 m across. A few miles beyond Gigjokull we begin our trek climbing along the flanks of Eyjafjalla. The soft volcanic tephras and modestly welded tuffs are deeply eroded by the constant rainfall. The trek is up and down, intermixed with stunning views. On the trail, looking up at Myrdalsjokull. The elevation on the trail is 1600 feet, and glacier line is 2200 feet. Scenic hike, but the volcanic terrain has been eroded with endless canyons, so lots of climbing and descending. The last climb of the day is up a hill called Rettarfell. Coming down the trail there is a view across the Krossa river. 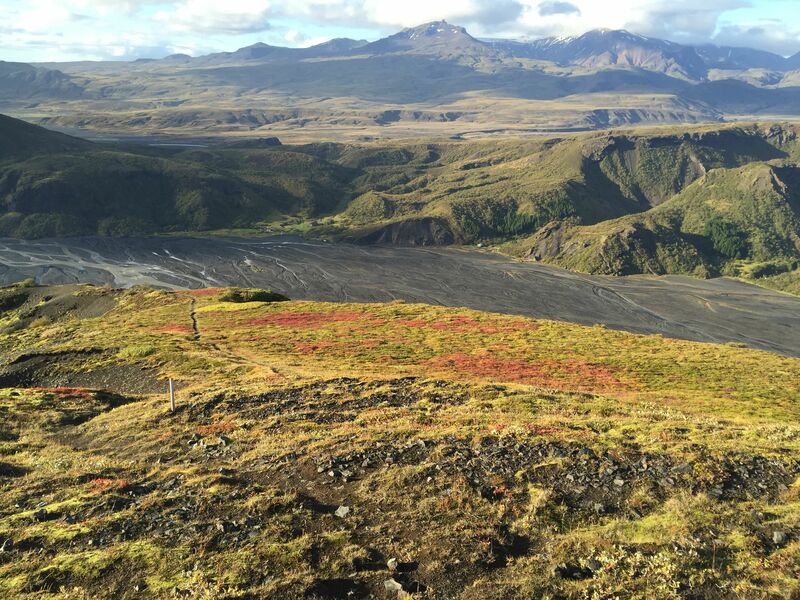 The fall colors are tremendous – delicate red flows intermixed with yellow grasses offset the harsh black and gray volcanic rumble. In the picture below the end of journey is in sight – a hut across the river in the center of the photograph. Descending off the flank of Eyjafjalla into the hut for the evening. Fall colors are spectacular. The first day has been perfect weather wise, and the trekking was quite enjoyable. However, the weather forecast for the next day is ominous. Descending into the valley for the end of day one. One of the most challenging aspects of the trek is actually crossing the Krossa. The river is braided with many strands, and the main sections have channels flowing several feet deep. In the hut there is a “book of shame” that documents all the jeeps that attempted to cross the river only to become mired, and then flooded. Various hiking clubs in Iceland have built portable bridges that can be wheeled from one location to another as the river changes its course. From high up on the ridges at Rettarfell I can see the bridges, but they look like they are just stuck out randomly on the flood plain – we joke that Iceland, like American, has its bridges to no where. Fortunately, the bridges are in the right spot and traveling across to the hut for the evening is uneventful. Early in the morning of day 2 in Thorsmörk – a short night because we waited for a meager northern lights. The hut is comfortable – and a light sleeping bag on a foam mattress is more like probation than a life sentence in prison. Although the clouds began to come in around 10 pm, we held out hope that the total darkness of the remote area would reward us with a glimpse of the northern lights. Indeed, as predicted by the Iceland Aurora Watch, the lights appeared at 10:30. However, they were quite weak and fleeting. The was a chance that they would reappear at midnight, but all we got for that wait was sleep deprivation. On the other hand, the night sky was filled with stars I seldom get to see, and the Milky Way splashed across the horizon like a haphazard paint stroke. First morning’s light. Clouds moving in, but barely indicated the steady rain to follow. 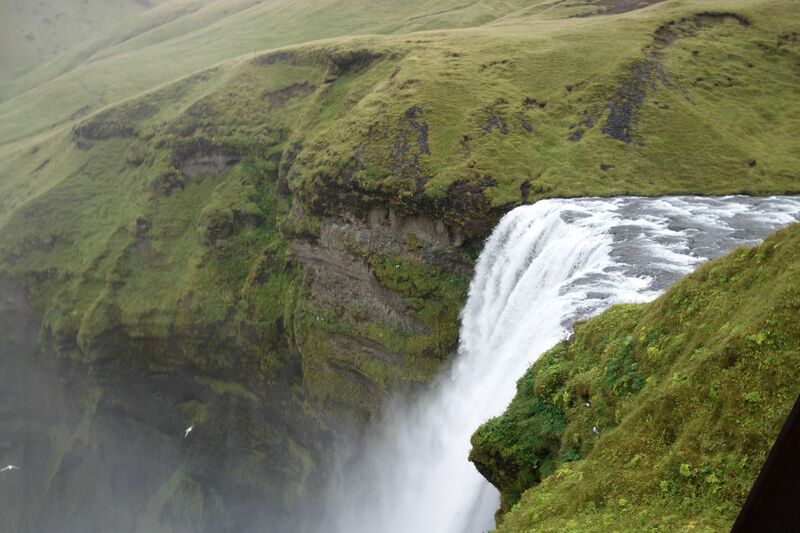 The plan for the second day was a 22 km trek with a descent along the Skógá River, ending with a spectacular water fall, Skógafoss (foss means “falls” in Icelandic, so Skogafoss waterfall is also a wonderful redundancy!). However, by 10 am the rain was falling in buckets, and the wind had gusts in which it was impossible to remain upright. We shortened the hike – but covered distances along the trail on both sides of the pass. By 2pm it was clear that this trek would mostly be noted for the fact that we did not drown. Skógafoss falls, along the Skógá River, draining both Eyjafjallajökull and Myrdalsjokull. The drop across the basalt cliff is about 60 m, and produces a persistent mist. This mist is famous for strong rainbows…however, there are no rainbows in the driving rain. The end of the trek comes with the realization that Michelle’s rain gear is no longer certified…everything leaked. End of the trek – and the 20 year old quality raincoat that can now be best used as a sponge. After the trek we made a short trip to Reynisfjara, which is famous for its black sand beaches. The beaches are indeed beautiful, but it is interesting that if you say “black sand beach” to an Icelander they will reply – all our beaches are black sand, and there are too many miles to count. 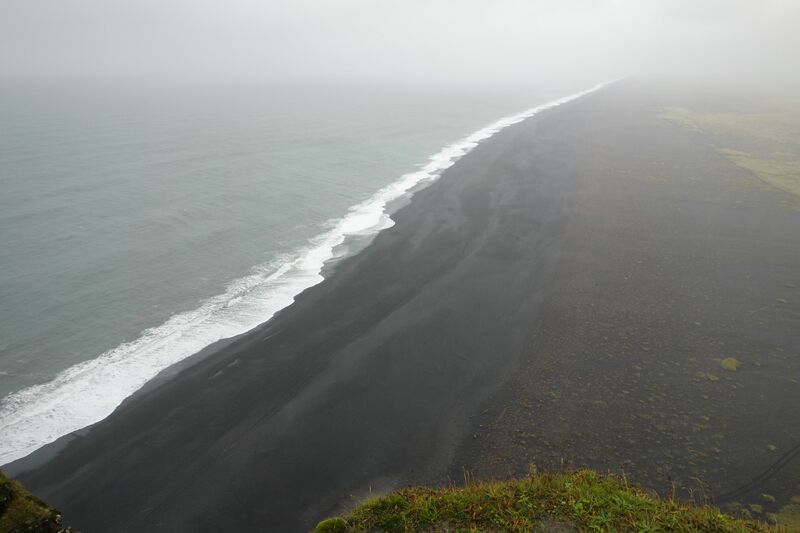 Black sand beaches of Reynisfjara. 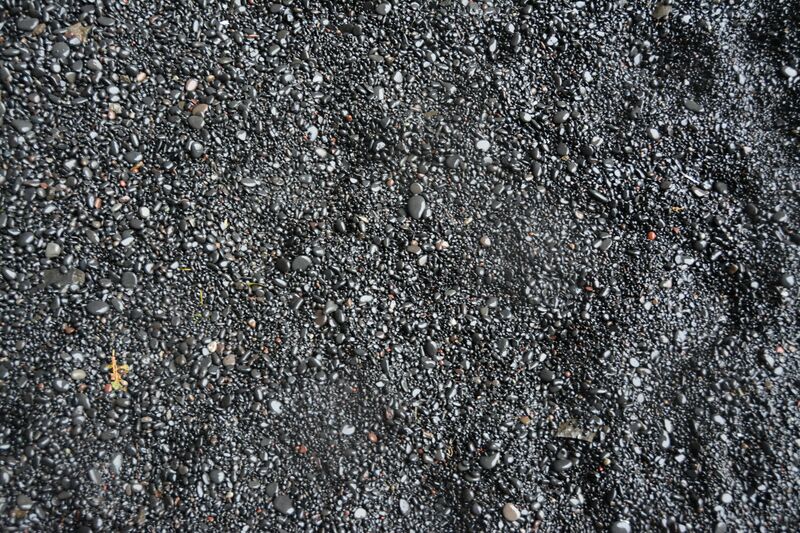 The “sand” is actually pebbles of basalt. 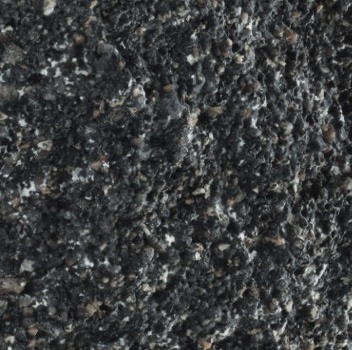 A close up of the “black sand”. The image is about 2 feet across. I tried running on the beach, and it was quite difficult! The purpose of the trek was to visit the glaciers and volcanics of the hotspot. Although the scenery was amazing, it was difficult to see uniqueness in the volcanics; it is clear that the stratavolcanoes are broad and much larger than the modest structures along the extension of the Reykjavik Ridge. However, the changes in rock type is subtle – at least to the eye. No visit to the volcanoes of southwest Iceland would be complete without a journey to Geysir and then on to the second largest Icelandic glacier, Langjökull (strictly speaking, Langjökull is an “icecap” – meaning it flows in all directions from its summit). This particular journey is not amenable to running (or trekking), so we hired a driver. 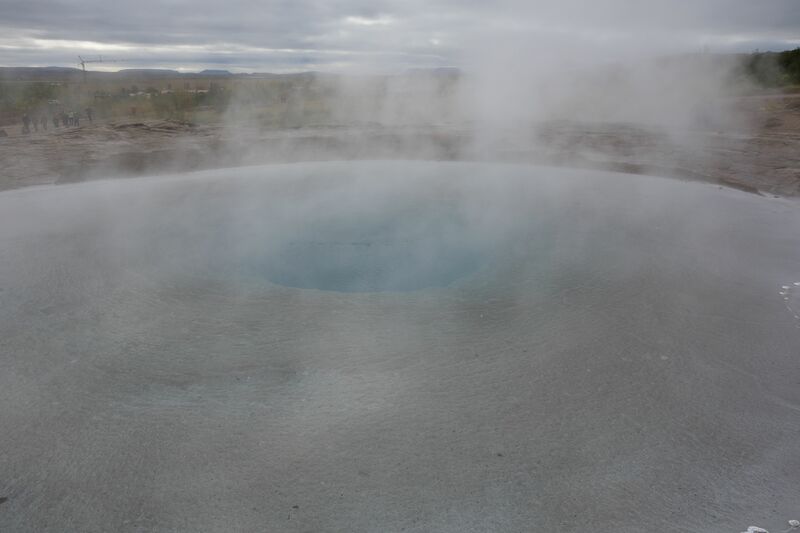 The pool of hot water over The Great Geysir in the Haukadalur Valley. The valley sits in a structural embayment within a rhyolite dome, and the meteoric waters that fall on the dome descend through cracks and are heated by a shallow magma body. The Great Geysir no longer erupts, but that probably is a temporary condition. The Haukadalur Valley is about 50 km northeast of Þingvallavatn. There are a half dozen large, boiling hot springs in an area roughly the size of two football fields. Presently there is only one of these that erupts with regularity – Strokkur – which has a periodicity of about 8 minutes. The Great Geysir was the first boiling fountain described in literature, and was adopted into the English language as “geyser”. In the past the Great Geysir had eruptions that reached 170 m in height. 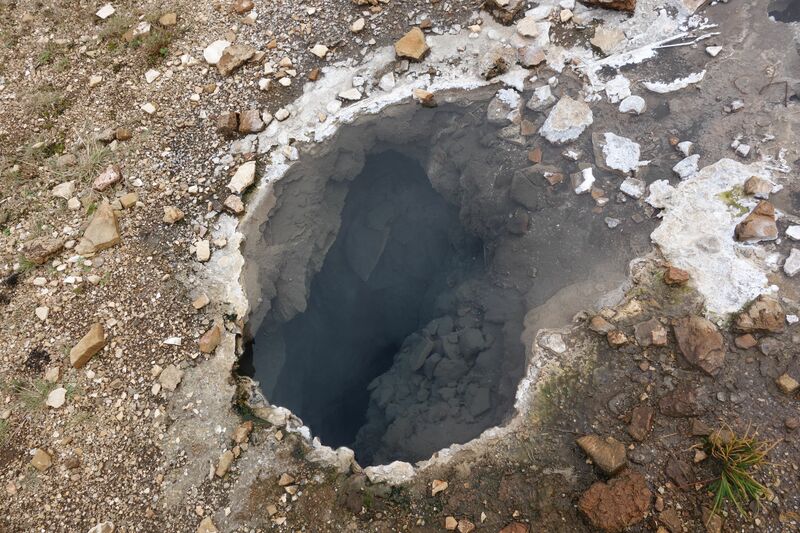 The plumbing of the system of hot springs appears to be highly influenced/connected to the occurrence of earthquakes in the area. Moderate sized quakes appear to turn on and off the eruptive cycles of the various springs. Crystal clear water in a boiling hot spring. Looking down this conduit one can see approximately 2 m (or so the sign says). Although the water is crystal clear, every few minutes a cluster of bubbles ascend releasing pungent H2S gas. Haukadalur Valley suffers from inevitable comparisons with Yellowstone and Old Faithful. The modest sized region is thick with tourists – but most of these are loaded and unloaded in large buses that follow a loop called the “Golden Circle”. We did not spend much time at Geysir, but it was on the way to Langjökull so the stop is worthwhile. 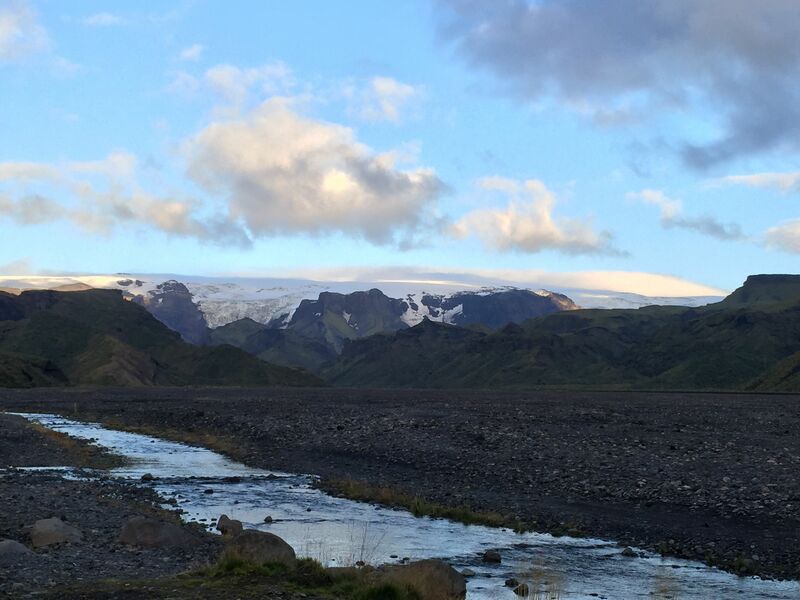 The massive glacier Langjökull is visible from Haukadalur, and frames a horizon as an imposing block of snow and ice. Langjökull – a massive ice cap glacier. The glacier has a volume of ice that is approximately 200 km3. Late in the season – like the 3rd week in Sept — the lower reaches of the glacier is covered with black mounds that resemble giant ant mounds. Langjökull covers a highlands that is actually two active volcanic systems. The glacier is about 50 km long in the north-south direction and 20 km wide (east-west); at its thickest the ice is 580 m. The large size of the glacier makes it easily seen from space (see the location map at the top of the blog section on the Hengill run). Unfortunately, the glacier is in rapid retreat. Using 1990 as a baseline, Langjökull has lost 15% of its ariel extent, and models project it will disappear by the middle of next century. 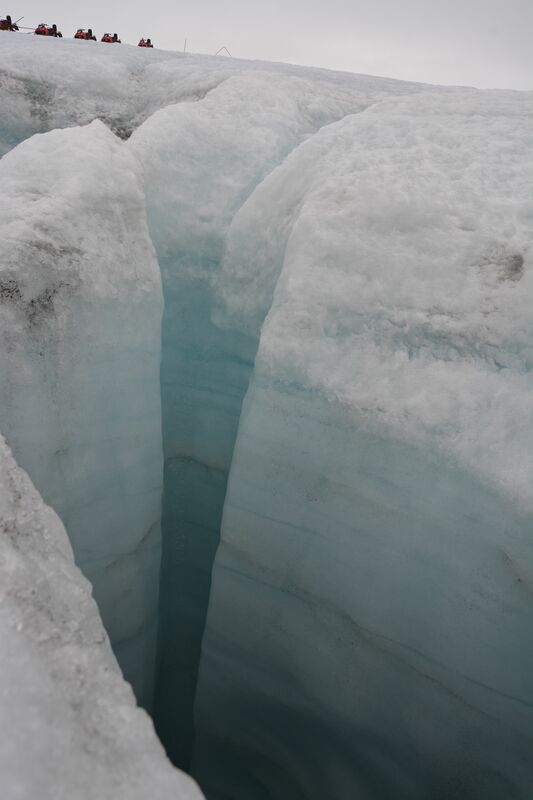 A large moulin – vertical hole or shaft in the glacier that serves as a plumbing system within the ice mass. Our line of snow mobiles are in the upper left for scale. We toured the glacier via snowmobile. As advertised, driving the snowmobiles was no more difficult than driving a bicycle. I ride my bike a lot, so my thought was “this will be really easy”. Well, Michelle and I sharing a snowmobile means that we had to coordinate our leans with every sharp turn. Our coordination was not world class. However, the tour allowed us to see the scale of the glacier, and certainly observe the obvious signs of ice retreat. 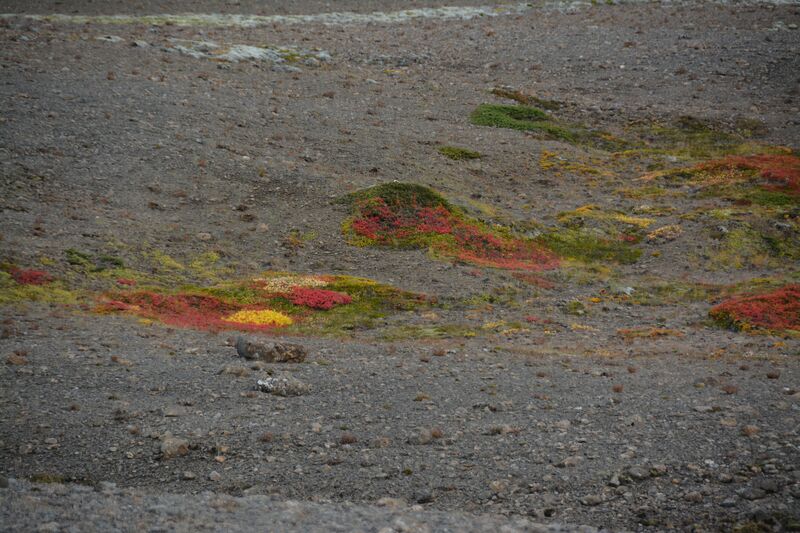 A spot of color in the volcanic highlands. The fall season gives texture to the otherwise monotonous gray of volcanic rubble. 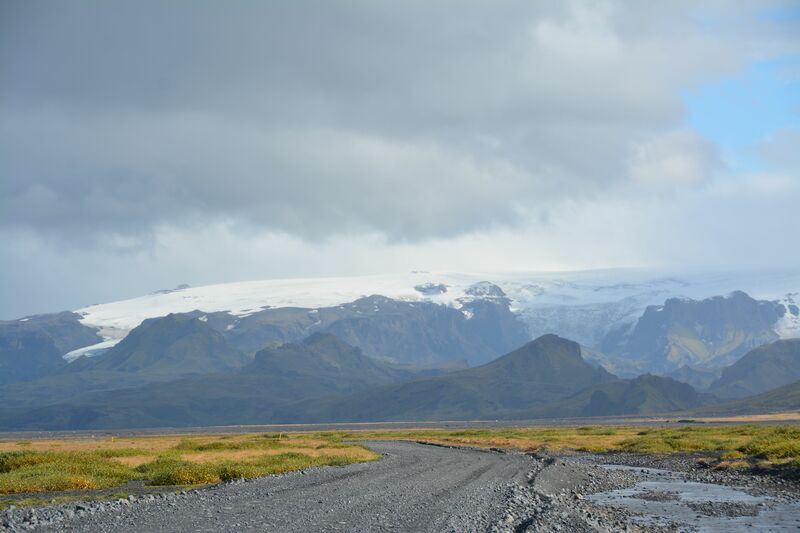 The journey to, and away from Langjökull is a winding dirt road through barren volcanic badlands. However, late in the fall the sparse vegetation is alive with bright color. There is something majestic about survival of these plants even in the most hostile environments. 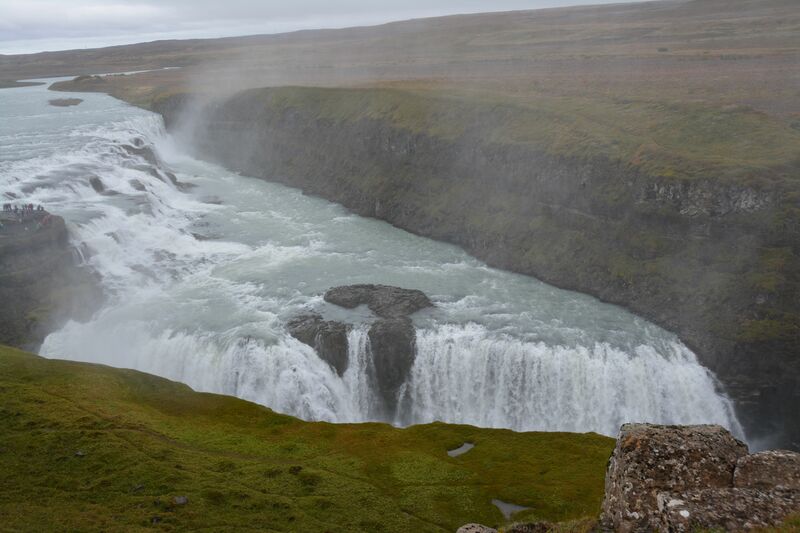 The most famous water fall in Iceland – Gullfoss. 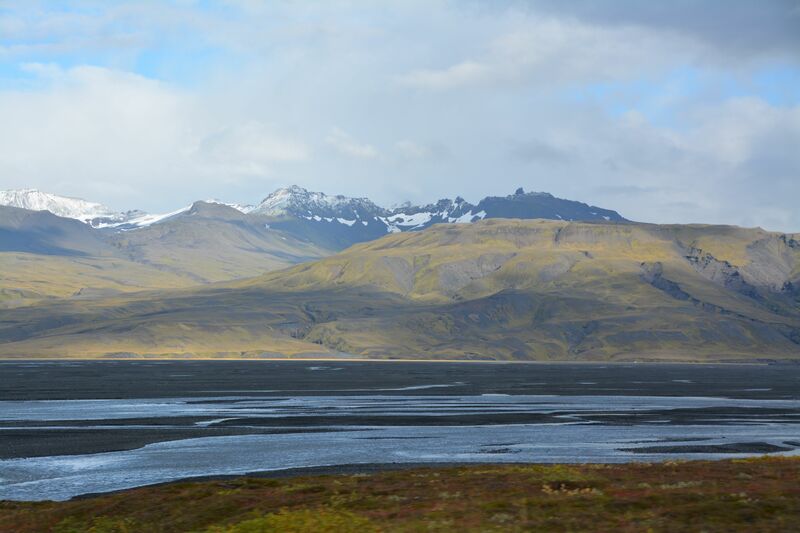 The drive back to Reykjavik follows the Hvítá river for a short distance. Along this route the river tumbles over a 3 step staircase creating a beautiful waterfall. Gullfoss, like Geysir, is on the tour bus route for the Golden Circle so the area is always crowed with camera clickers (okay, I was also a camera clicker). 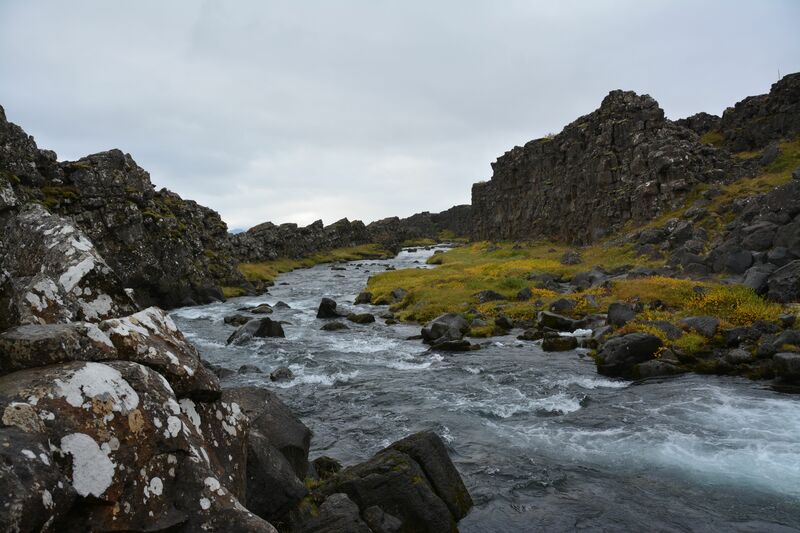 The geology of Iceland is wonderful – and although the southwestern portion of the island is relatively compact, it is clear that a series of runs and treks hardly do justice to the remarkable tectonic processes that are going on here. The evidence of volcanism is everywhere, but strangely mysterious in that it is also hidden. The forces of water, ice and erosion are also everywhere. Nothing about the landscape of the island seems permanent; wait a hundred years, and eruptions and floods will change the view shed. 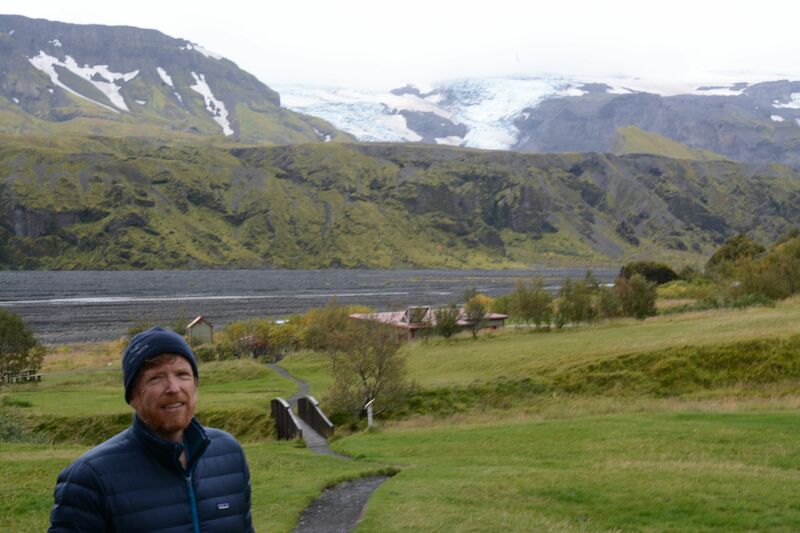 It is clear that a real visit to Iceland requires far more than a few days…but it is a great place to run! 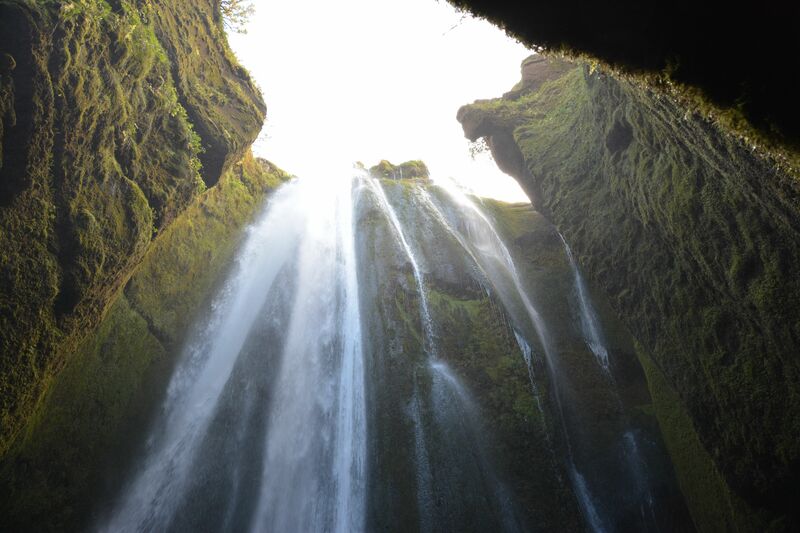 Urridafoss falls – the largest VOLUME waterfall in Iceland, and totally off the beaten track. Waterfalls here a ubiquitous, and perhaps a bigger signature of the geology than even the volcanoes. My experiments proved that the radiation of uranium compounds … is an atomic property of the element of uranium. Its intensity is proportional to the quantity of uranium contained in the compound, and depends neither on conditions of chemical combination, nor on external circumstances, such as light or temperature — Marie Skłodowska Curie, Polish/French scientist who won 2 Nobel Prizes; her doctorate thesis was the first to show that radiation came from an atom, not from environmental conditions. When rock blooms yellow and Geiger counters rattle – uranium! From a National Geographic Society publication, 1953. Click on any figure for a larger version. The theme of the 2015 Denver Gem and Mineral show is “Minerals of the American Southwest”. The theme evokes images of colorful copper minerals from Arizona, gold and silver from Colorado, red beryl and champagne topaz from Utah, and perfect fluorites from Bingham, New Mexico. The four states have a rich mining heritage with boom towns, barons, and villains. The influence of the American Southwest on the modern mineral collecting hobby is also outsized – from personalities of famous collectors and mineral dealers to mega mineral shows, perhaps no geographic region is more influential. The southwest was also the site of the greatest mineral rush in history, but is largely unremembered – the great uranium rush of the 1950s. My father and I visited many of the uranium mines – mostly the abandoned ones in Utah – in the early 1970s, and I collected a boat load of “yellow smears”. I learned how to read the x-ray diffraction films from studying samples I prepared for identification. I was cautioned to store these treasures in the barn rather than my bedroom because of issues with radon or radioactive decay. 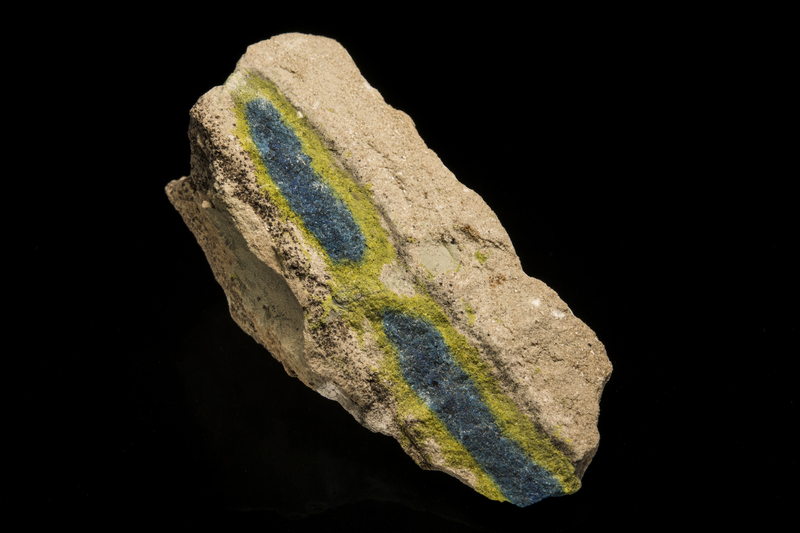 I never really built a systematic collection, and my specimens were eventually disposed of for environmental reasons, but I was fascinated by the story of the uranium minerals. In 1974, I read Edward Abbey’s book Desert Solitaire, and was deeply affectedly by his descriptions of the joy of isolation and the beauty of the canyon country and mountains around Moab. I also saw in this book the tremendous loss that we experience when we destroy wilderness. 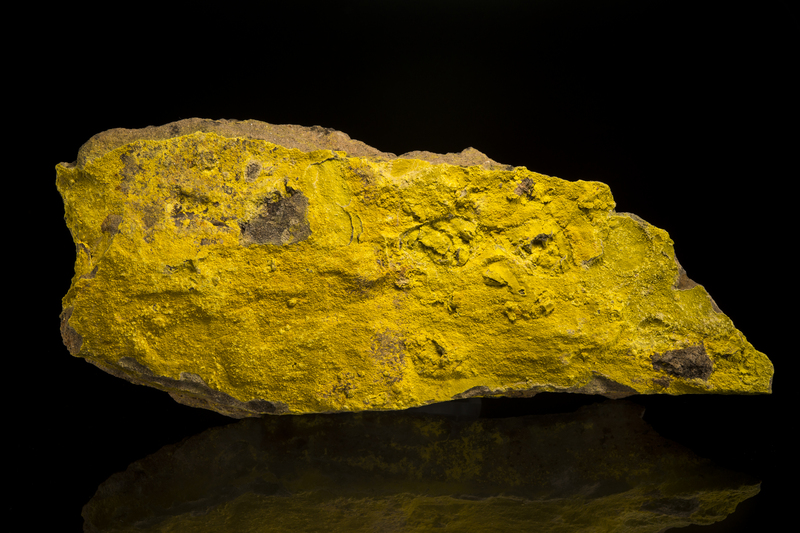 I was asked to talk at the 2015 Denver show on minerals of the southwest, and it was assumed I would wax on and on about the silver minerals…but I decided to revisit uranium! The launch of the Manhattan Project in 1939 suddenly made uranium a valuable commodity, but established mines were few globally; in the US only a few mines in western Colorado were producing any uranium (mainly as a byproduct of vanadium mining). Leslie Grooves, director of the Manhattan Project secretly purchased the entire stockpile of Vanadium Corporation of America, which was stored at Uravan, Colorado – but that was only 800 tons of ore. Once the war was over the US had less than 100 pounds of enriched uranium (U235), and development of domestic uranium mining became a government priority. The newly minted Atomic Energy Commission announced remarkable incentives for new uranium discoveries: a price of $3.50 per pound of uranium oxide, and a $10,000 bonus paid on the delivery of 20 tones of ore that assayed 20 percent uranium oxide. 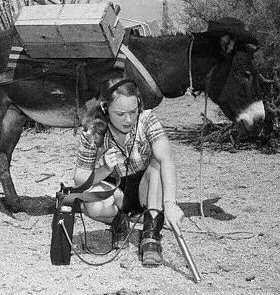 By the early 1950s there were more prospectors looking for uranium on the Colorado Plateau than ever mined gold in the history of California – in fact, there were 30 uranium “rushers” for every 1 ’49 rusher to the Sierra Nevada. 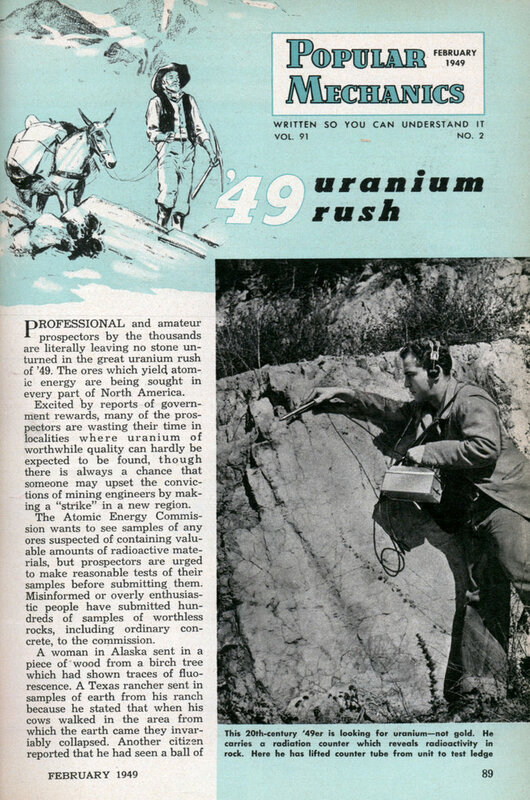 Hundred’s of articles appeared in the early 1950s publicized the “rush” for uranium. Many of these articles were funded by the AEC and suppliers of geiger counters. The AEC incentives worked — by the mid-1950s there were about 800 major uranium ore producers on the Colorado Plateau, and ore production was doubling every 18 months. The rush made more millionaires than the great Colorado silver rushes of the 1870s or the Arizona copper rushes of the 1880s. Moab, Utah was dubbed the “Uranium capital of the World”, and had 20 millionaires for every 250 citizens. The AEC cancelled the bonus for uranium production in the early 1970s, and eventually the mining industry declined to a subsistence level. However, the rush to the Colorado Plateau had a huge impact – from 1949 to 1971 the mines produced about 400 million tons of ore that yielded 200,000 tons metric tons of uranium metal. 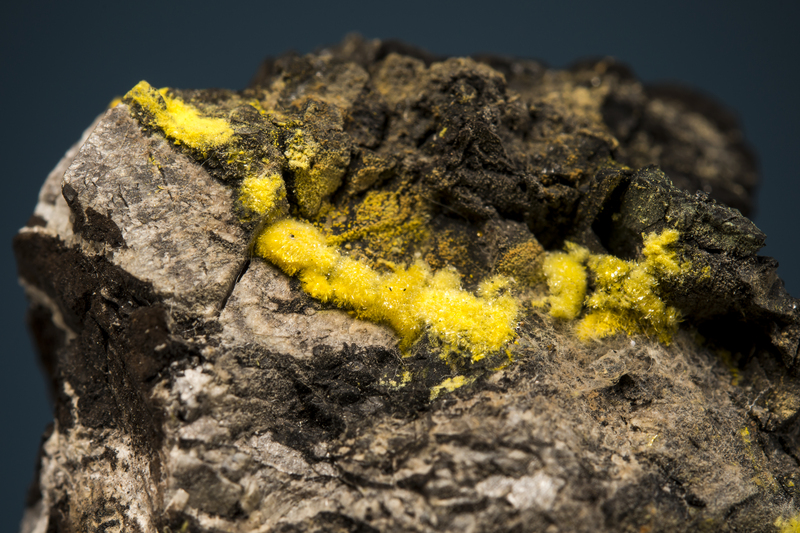 Coincident with the great uranium rush, mineral hobbyist clubs and minerals shows exploded – the American Federation of Mineralogical Societies (AFMS) was founded in 1947. Although it is a stretch to directly connect the great uranium rush with the rise of mineral collecting as a hobby, it is obvious that the heavy promotion of uranium prospecting peaked the interest of many Americans, and rock hounding entered a golden age. Many collectors purchased or collected uranium minerals from the Plateau, and these prizes sat in places of honor in the collector’s cabinets. However, as the hazards of uranium mining became understood in the 1970s, collectors began to dispose many of their specimens. 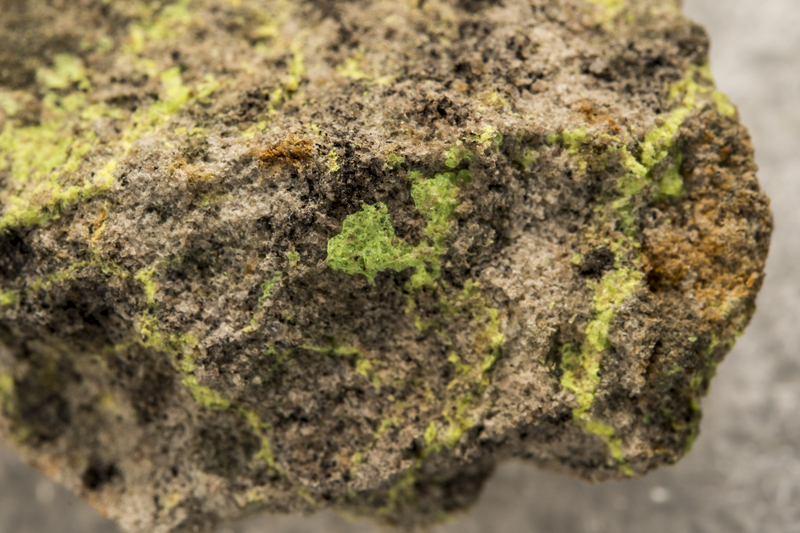 Today, it is almost impossible to find a fine Colorado Plateau uranium mineral specimen – and the heritage of an amazing American event has faded from the public memory. 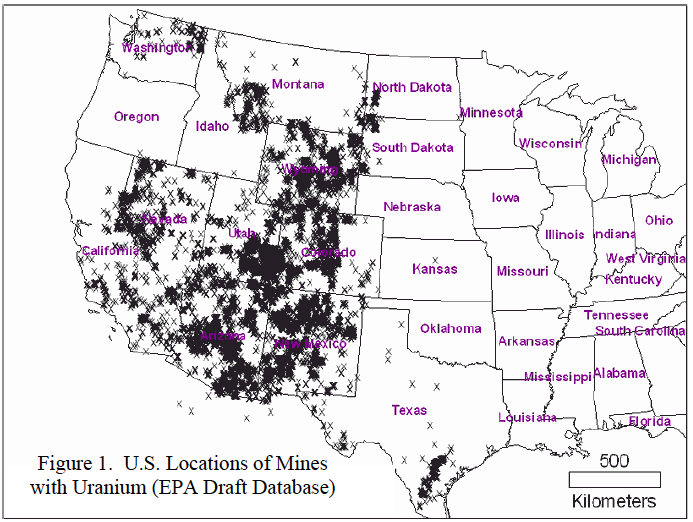 Map showing the location of uranium mines in the US. The data is from a EPA data base, and does not show the size of the mine. However, the density of the mines is a good indication of the richness of the deposits. The history of uranium on the Colorado Plateau begins a half century before the Great Rush when prospectors were looking for the more valuable commodities of radium and vanadium. 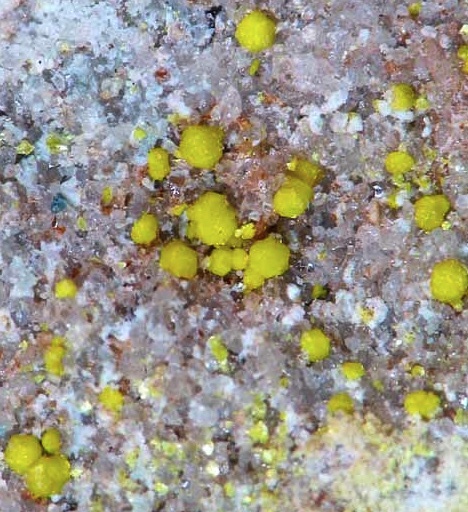 Settlers in the Paradox Basin in southwest Colorado knew of a yellow, powdery material found in sandstones before 1880; it is likely that Ute and Navajo Indians collected this same material as a pigment for hundreds of years. By the late 1890s various prospectors had collected a few hundred pounds of the material, but did not know what it was, nor could they find a market. In 1881 Tom Talbert discovered the same yellow material in Montrose County, and eventually this material found its way to Gordon Kimball in Ouray. Kimball sent samples to Frenchman Charles Poulot (residing in Denver) in 1898, who determined it contained both uranium and vanadium. Poulot gave the material to M. M. C. Friedel and E. Cumenge (of Cumengite fame) who determined an approximate formula: K2(UO2)2(VO4)2·1-3H2O Also in the samples were significant amounts of radium – which is a decay product of U238. This coincided with Curie’s discovery of the element radium, and she began to purchase carnotite from Colorado for research. 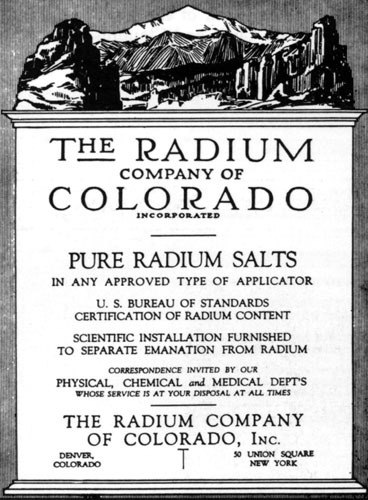 Radium became the vanguard material for worldwide research on radioactivity, and a number of mines were staked along the Colorado Plateau. Colorado radium played a very significant roll in the lab of Madame Curie, and was essential to define the unit of radioactivity, the Curie. Aside from staking claims, nothing of substance happened in carnotite mining until 1910 when a new medical market for radium developed — it appeared to have a dramatic effect on certain cancerous tumors — and southwestern Colorado became a major supplier. However, the outbreak of WWI completely quashed the demand. As the demand for radium dried up, the demand for vanadium increased rapidly. It was discovered early in the 20th century that adding a small amount of vanadium increased the strength of steel. In 1905 Henry Ford was introduced to a vanadium rich steel, and was so impressed with its characteristics, he used it in the chassis of his Model-T. By the end of WWI the carnotite mining shifted from the focus on recovering radium to vanadium, and by 1922 radium recovery ceased all together. 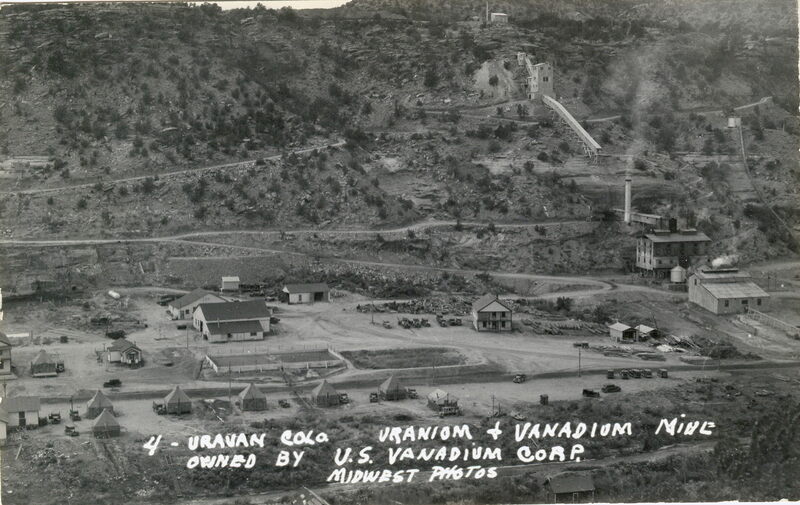 Although the demand for vanadium was cyclic, by about 1935 it had become an important enough metal that Vanadium Corporation of America purchased most of the former carnotite mines, and founded the town of Uravan (contraction of uranium and vanadium). Location of the carnotite deposits mined for radium and then vanadium before WWII. From Chenoweth, 1981. After 1936 there was a steady increase in prospecting and development of properties along the Utah-Colorado border targeted the Morrison Formation (Jurassic age), in particular, a fluvial sandstone/mudstone unit called the Salt Wash Member. 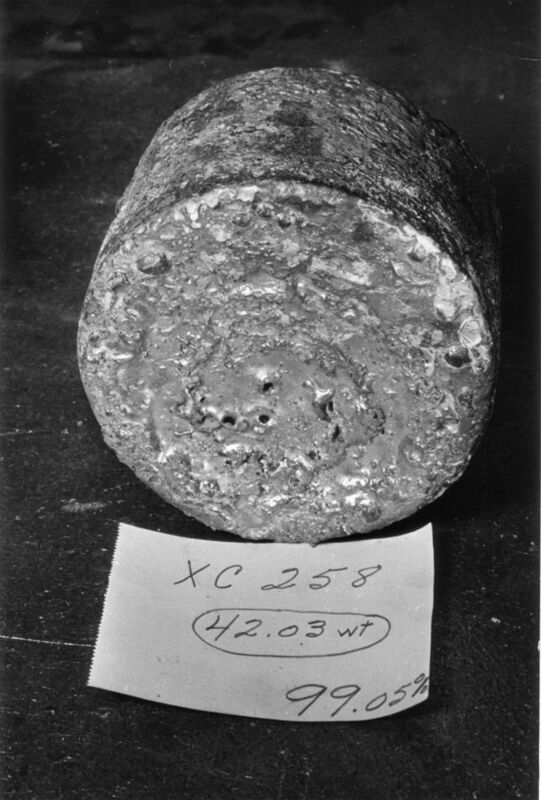 With the outbreak of WWII steel became essential; vanadium was declared a strategic metal, and more than 600,000 tons of vanadium ore with a 2% grade was produced. The modern era of uranium exploration and mining on the Colorado Plateau began when the Atomic Energy Commission was established by the Atomic Energy Act of 1946. All functions of the Manhattan Project, including the acquisition of uranium, were transferred to the ACE at mid-night, December 31, 1946. The AEC set up a procurement shop in Grand Junction, Colorado and begin devising schemes for securing uranium. At the time there were only 15 mines operating on the Colorado Plateau, and uranium was still considered a lesser product than vanadium. The AEC was the only buyer of uranium, and thus, set a price they thought would incentivize production; it soon became apparent that the AEC also had to be involved in the milling of ore, and provided bonuses for uranium oxide concentrations. The very first procurement contract was signed with Vanadium Corporation of American on May 28, 1947. The AEC demanded a rapid expansion of exploration and mining efforts, and provided assistance by undertaking geologic surveys and providing free assay services. Between 1948 and 1956 the AEC and the USGS tasked several hundred geologists to scourer the Colorado Plateau and make their maps and drilling core results freely available to prospectors. The AEC also built more than a thousand miles of roads across the plateau to promote access to the most remote regions. Prospectors and weekend treasure hunters flocked to Utah and Colorado, and later to New Mexico and Arizona. Some of these prospectors struck it rich, and lived life higher than the biggest copper or silver baron of the 19th century. One of these “lucky” prospectors was Charlie Steen. For two years Steen roamed the area around Moab, Utah and “barely” subsisted with his family in a trailer and tar paper shack. Using his experience in the oil industry, he was certain the uranium would collect in anticlines – sort of like an oil trap – and he drilled haphazardly. On July 6, 1952, Steen drilled into an incredibly rich deposit of “pitchblende” (uraninite) at 200 feet depth, and over the next year developed the Mi Vida mine. 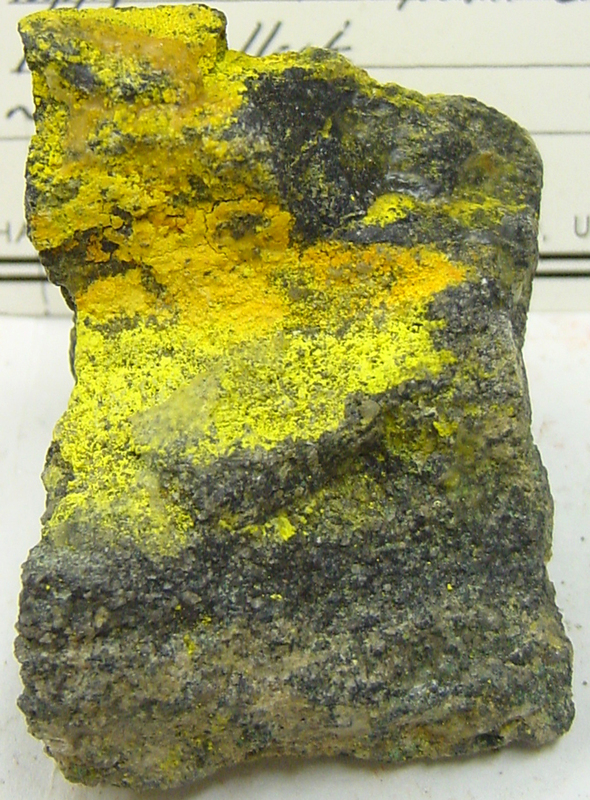 The fact that the ore was uraninite – not carnotite- in a rock type previously not shown to carry uranium, and at a depth that similarly unexpected, caught the government geologists by surprise. Steen became a multi-millionaire, and his find electrified the country – and greatly accelerated the rush to the plateau! 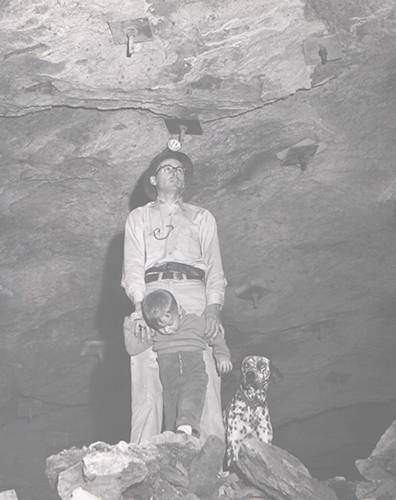 Geologists began to understand the nature of the Colorado Plateau uranium deposits in the late 1950s. 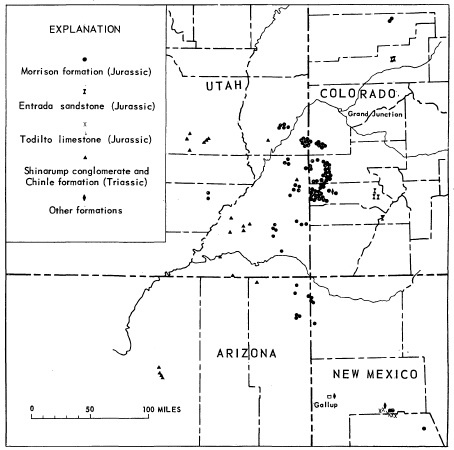 Garrels and Larsen (1959) published USGS professional paer 320, Geochemistry and Mineralogy of the Colorado Plateau Uranium Ores, and it became clear that hydrology was the most important factor in localizing the uranium in vast columns of sedimentary rock. Uranium deposits on the Colorado Plateau in 1959 with a size of more than 1000 tons. Uranium is found in more than a dozen sedimentary strata on the plateau but the Morrison formation of late Jurassic age and Chinle of Triassic age account for 95% of the produced uranium. The Morrison was formed from the erosional sediments derived from a highlands called the Elko that existed along what today is the Utah-Nevada border. These sediments were deposited in floodplains, river channels and swamps, not unlike the Mississippi delta today. The Chinle is dominated by eolian (wind-driven dunes) deposits with smaller river channels cut during intervals of more precipitation. The uranium appears to have mobilized by ground water; dissolving and moving sparsely concentrated uranium and precipitating and concentrating that uranium when structural or chemical boundaries are encountered. The deposition of the uranium occurred millions of years after the deposit of the sedimentary rocks — perhaps 100 million years later. The deposition is most signifiant where the sediments contained trapped organic materials – logs in river channels or organic ooze in swamps. In fact, there are many examples of petrified logs that have been completely replaced by uraninite or coffinite. The real key to the Colorado Plateau deposits is the long term stability of the sediment column. This stability has allowed dilute solutions to build these diffuse deposits. This is not the best environment to grow beautiful crystals, but small variations in chemistry has allowed for a wide range of uranium minerals. Through 2010 the Colorado Plateau has produced more than 600,000 tons of uranium oxide – and today contains 15% of the worldwide uranium reserve. High purity uranium “biscuit”. Uranium metal is not known in nature. The mineralogy of uranium is a fascinating and complex topic – the nearly ubiquitous presence off U in the environment, its large atomic radius, strong affinity for oxygen (lithophile), and high solubility in certain valence states leads to large number of secondary uranium minerals. The lithophile nature of U also means that 4.5 billion years of Earth evolution has concentrated the element in the crust; the statistic abundance of U in the crust is 2.7 ppm, as compared to 0.075 pm for silver and .004 ppm for gold. In other words, there are 675 atoms of uranium for every atom of gold in crustal rocks! Relative abundance of elements from cosmology, normalized to the abundance of Si. Note that uranium, as expected with its large Z, is much rarer than lighter elements. It is a few orders of magnitude less common than gold. 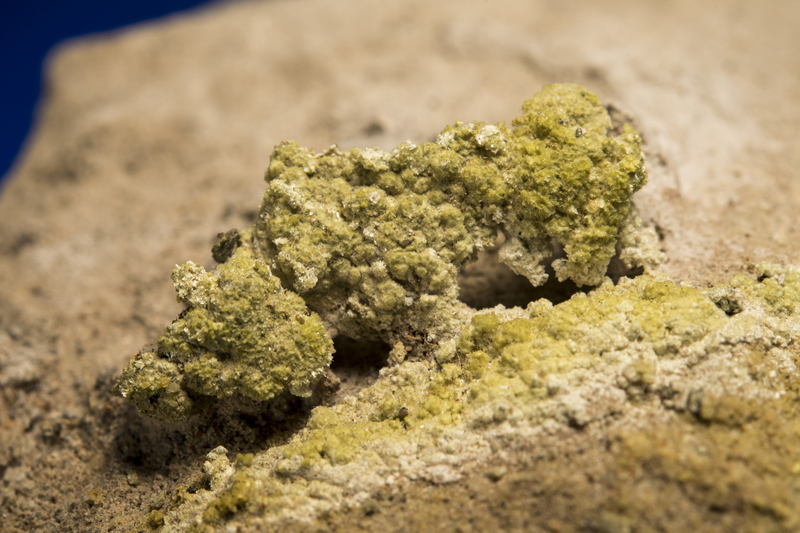 However, uranium is strongly lithophilic, and has been concentrated in the Earth’s crust to the point that it is more common on the surface than either gold or silver. The uranyl ion has a linear structure, with very strong bonding between the uranium and oxygen, and it is highly soluble in ground water. 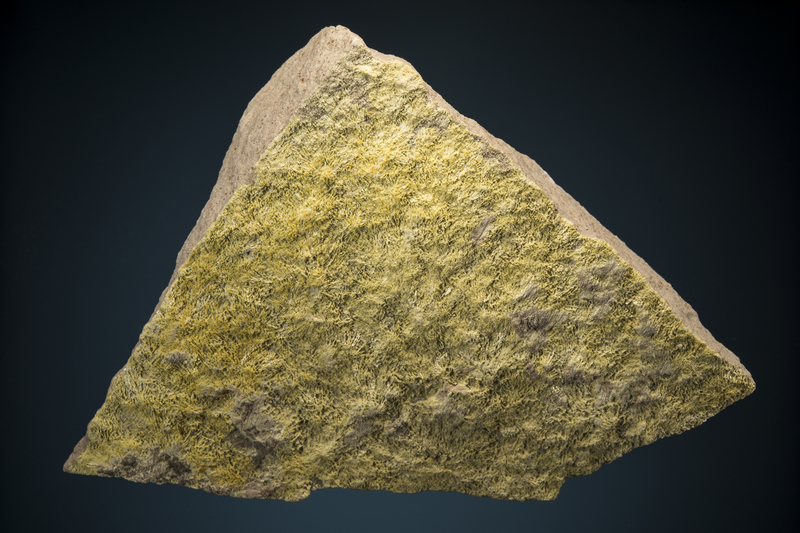 This high solubility leads to extraordinary mobility of uranium, and a key contributor to Colorado Plateau deposits. The uranium mined today in Grants or Paradox Basin did not originate anywhere near those locations; it likely was deposited in minor uraninite deposits during the billions of years of mountain building in what has become the North American Plate. 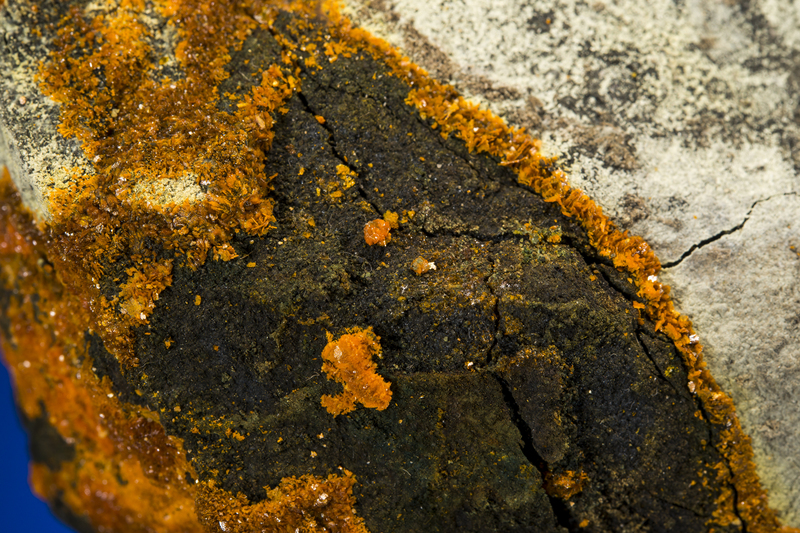 Decomposed, oxidize, and transported through great distances, the uranium was concentrated when subtle encounters with ground water chemistry changes. 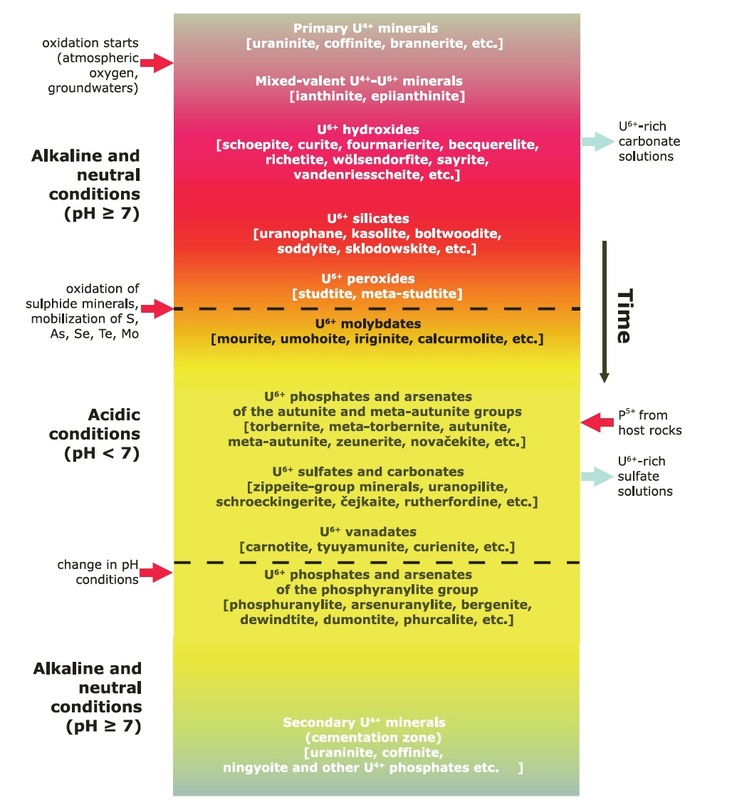 Paragenetic sequence of uranium minerals — from primary uraninite with a +4 valence to hundreds of uranium minerals with a +6 valence (from Plasil, 2014). The mineralogy of U6+ is very diverse because of the uranyl ion; it has a linear, dumbbell shaped structure that cannot be easily substituted by other high valence cations. The uranyl ion will most commonly attach to tetrahedral anion groups; SO4, PO4, AsO4, SiO4. Any charge balance is then accommodated by other cations. The figure above is a generalization of the paragenes of uranium minerals; at the top is the primary oxides and moving down the chart shows the minerals that form as uranyl migrates away from the primary source. Typically uranyl carbonates form first, and vanadates – like carnotite – form far from the original source and after many generations of mineral growth and decomposition. Carnotite, Happy Jack MIne, Utah. BYU collection. 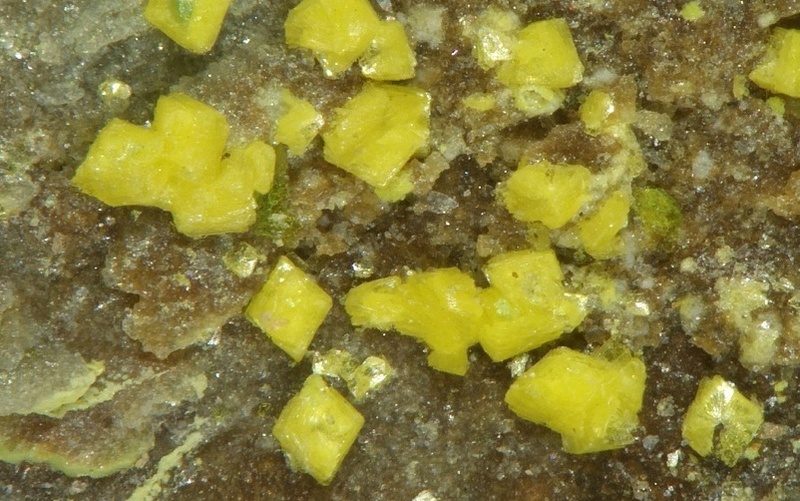 Carnotite crystals, to 2 mm. Monument Valley, Arizona. Stephan Wolfsried photograph and specimen. Coffinite, Mount Taylor deposit, Ambrosia Lake area, Grants District, McKinley Co., New Mexico. Field of view is 3cm. Uraninite, Big Indian District, San Juan Co., Utah. Tyuyamunite, Paradox Valley, Montrose Co., Colorado. Dave Bunk collection, Jesse La Plante photograph. Zippeite, Big Gypsum Valley, San Miguel Co., Colorado. Dave Bunk collection, Jesse La Plante photograph. Slick Rock, San Miguel Co., Colorado. Dave Bunk collection, Jesse La Plante photograph. Schrockingerite, Monogram Mesa, Montrose Co., Colorado. Dave Bunk collection, Jesse La Plante photograph. Metamunirite, Burro Mine, Slick Rock, San Miguel Co., Colorado. Dave Bunk collection, Jesse La Plante photograph. 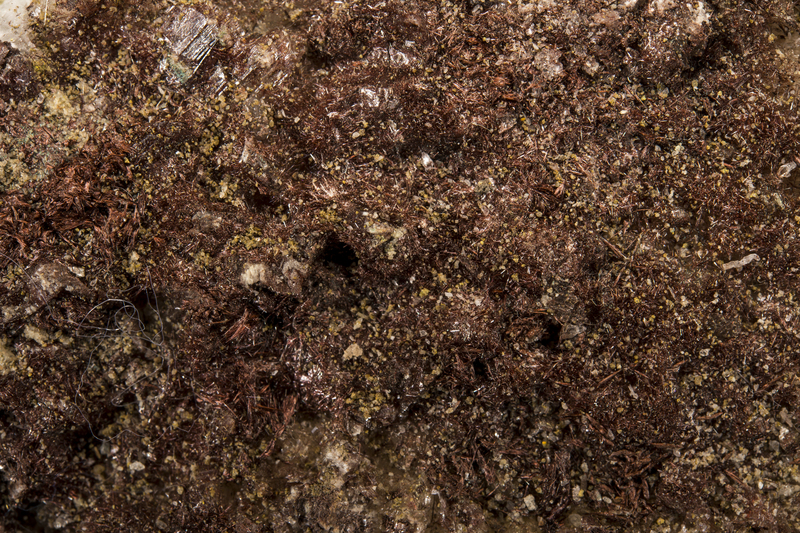 Metahewettite, Hummer Mine, Uravan, Montrose Co., Colorado. Dave Bunk collection, Jesse La Plante photograph. Pascoite, Big Gypsum Valley, San Miguel Co., Colorado. Dave Bunk collection, Jesse La Plante photograph. 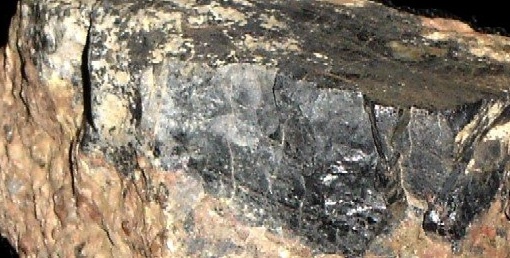 Metarossite, Arrowhead Claim, San Miguel Co., Colorado. Dave Bunk collection, Jesse La Plante photograph. Hewettite, Hummer Mine, Uravan, Montrose Co., Colorado. Dave Bunk collection, Jesse La Plate photograph. The Great Uranium rush was over by the early 1960s. Many lone prospectors roamed some of the most desolate and beautiful country in the world in search of radioactive treasure. Uranium mining in the 1960s was controlled by large corporations, and huge open pit mines like Jackpile east of Grants, New Mexico supplied tons of uranium. By 1971 the government had more uranium than it could possibly use, and cancelled the incentives. By 1980 the world market drove the prices for the silver-colored metal to prices that shut down even the largest producers. Today the prices occasionally spike, leading to much discussion about reviving mining on the Colorado Plateau. However, the heavy environmental toll has a very dark legacy. It is unlikely that there will ever be another uranium mine in the Triassic and Jurassic sandstones that make the plateau look like the landscape of Mars. I am glad I will not be young in a future without wilderness — Aldo Leopold, scientist and author, New Mexico Forester, and architect of the modern Environmental Ethics movement. “Why do you like to run?” – a question I often get asked. I usually make up some answer to steer the conversation back away from emotional strands to more comfortable analytic themes. 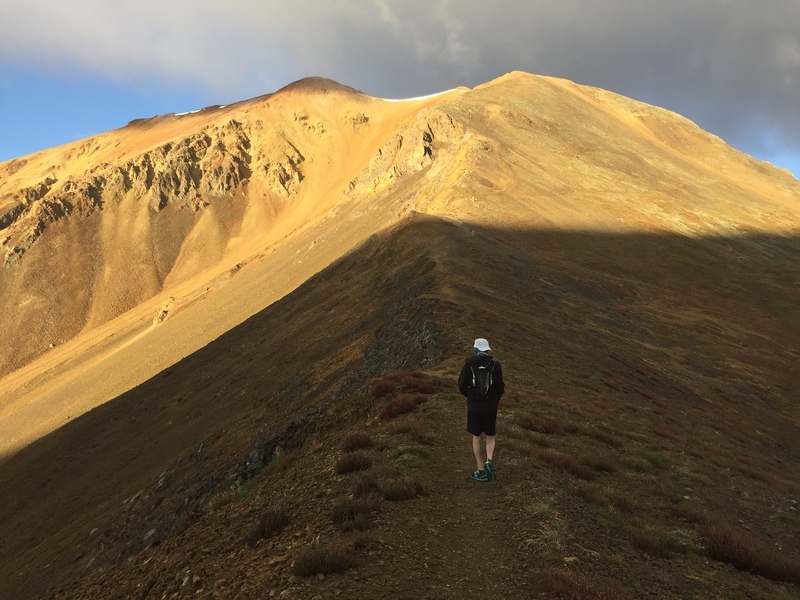 In fact, I don’t like to just “run” – I am not really very good at it (if being good is measured by being speedy), and although I run most every day, my joy is found ON the run, especially along rough and rocky wilderness trails where the enormity of nature overwhelms prosaic modern life. The irresistible forces of geology, the incredible delicate touch of nature that can make even the smallest flower bloom with perfectly symmetry, winds that carry no smells made by man – these are the things that unleash astounding joy. At the end of the day I like having accomplished something difficult in a run, but that is more about being a driven personality; it is the joy of nature that makes running so essential to me. Most any trail can unleash nature, but there are some very special places for me that are beyond the pale. 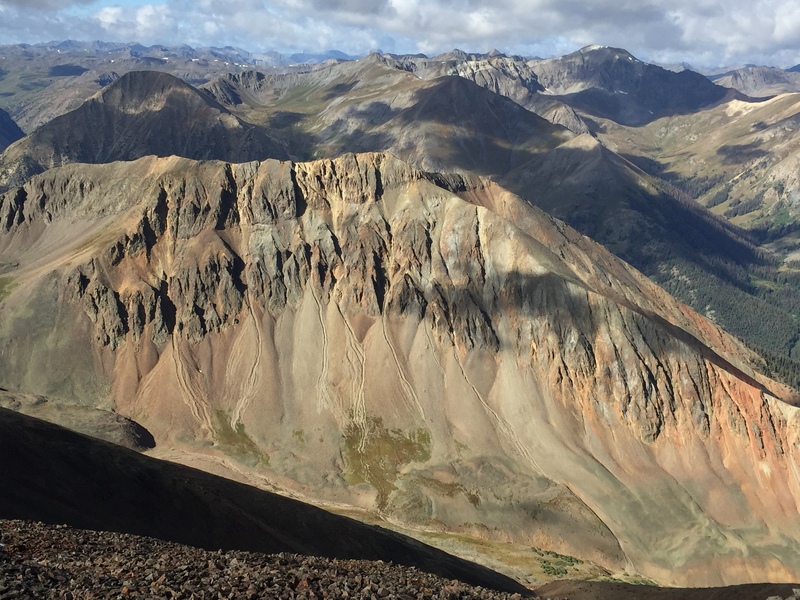 The San Juan Mountains are my personal enchanting wilderness; not only are the mountains and geology stunning, but rich history of minerals and rugged miners are backdrops to a place that I have visited for more than a half century. The wilderness here is stark – miles and miles of exposed ridges and peaks far above timberline. But surprisingly, there is evidence everywhere that prospectors touched and turned over rocks in the most inhospitable places; nature is supreme, but the San Juans have been a siren for hundreds of years for people like me. Top of Handies Peak (9/6/15) looking north after a brief storm. 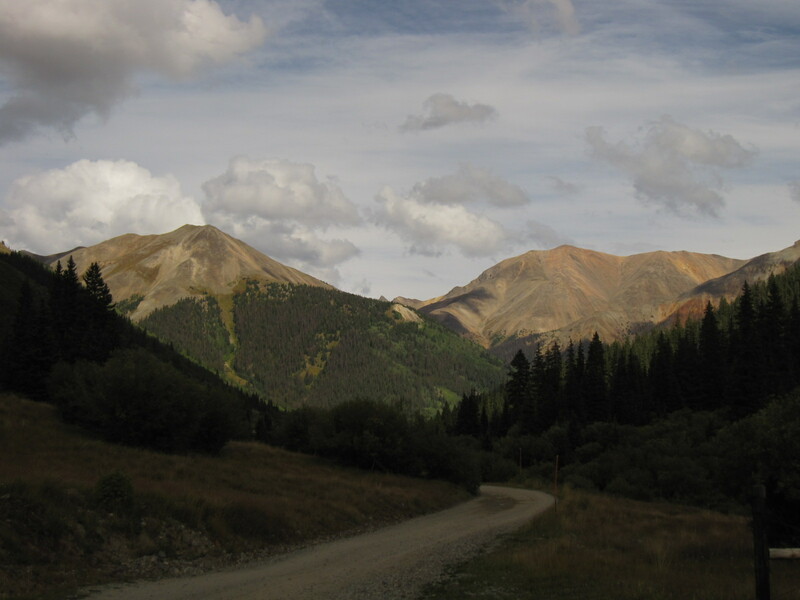 The San Juan Mountains have miles and miles of rugged peaks above tree line. Near Lake City, the Red Cloud Wilderness Study Area is nearly 40,000 acres with 34 peaks above 13,000 ft. Despite my motivation of joy of running in nature and an espoused aversion to “racing”, I do seek out and enjoy organize ultra trail runs. I choose interesting places – mostly based on geology or history – and toe the line on a half dozen 50+ km races per year. I try to run fast, but in reality, I am a jogging geoscientist. I am happy with that, but hate failure nevertheless. 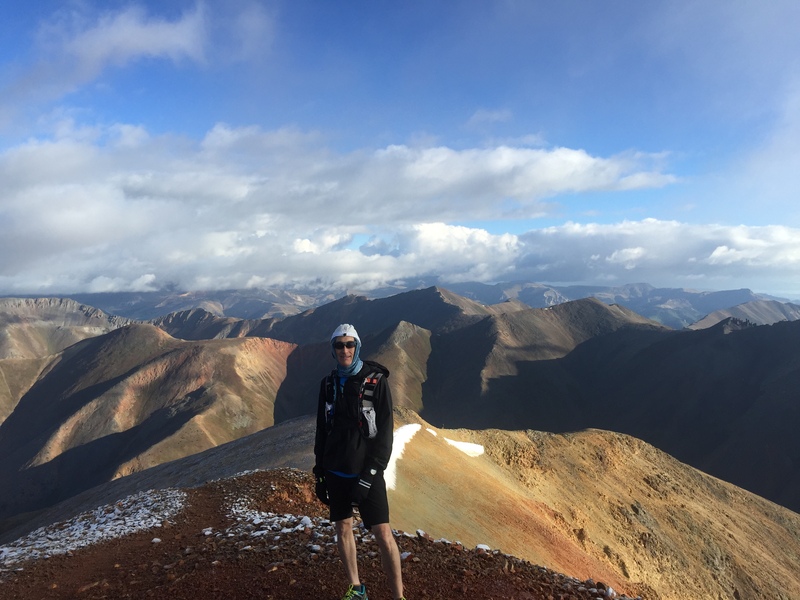 Earlier this year I stumbled and fell during a glorious race in the San Juan Mountains known as the San Juan Solstice 50 miler (SJS50). I have unfinished business with this race, and have focused training around next year’s event. Of course, this means “training” by returning and running often in the San Juan Mountains. Summiting Red Cloud, day II of the Heart of the Caldera. This picture is about 35 minutes after first sunrise, and about 13,500′ in elevation. Fantastic terrane! I decided to set up a trail run(s) within the Lake City Caldera and enjoy the high San Juans before winter once again shroud the peaks in impassable snow. 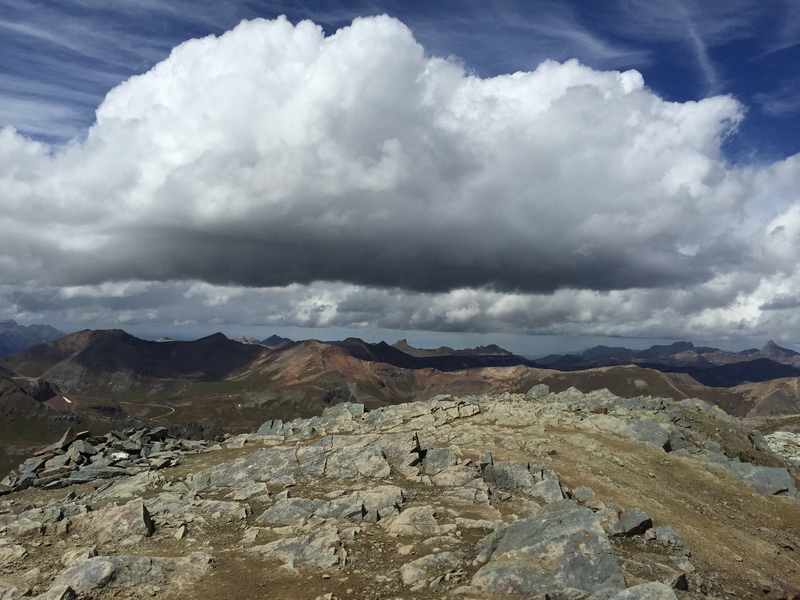 Labor Day weekend traditionally marks the change in session in the San Juans – although it is quite common to have great weather into mid-October, it is also not usual to get freakish September snows, making running above 13,000 feet a Darwin-Award type event. Day I of the Heart of the Caldera was a modest 16 miler in the northeast part of the Lake City Caldera. 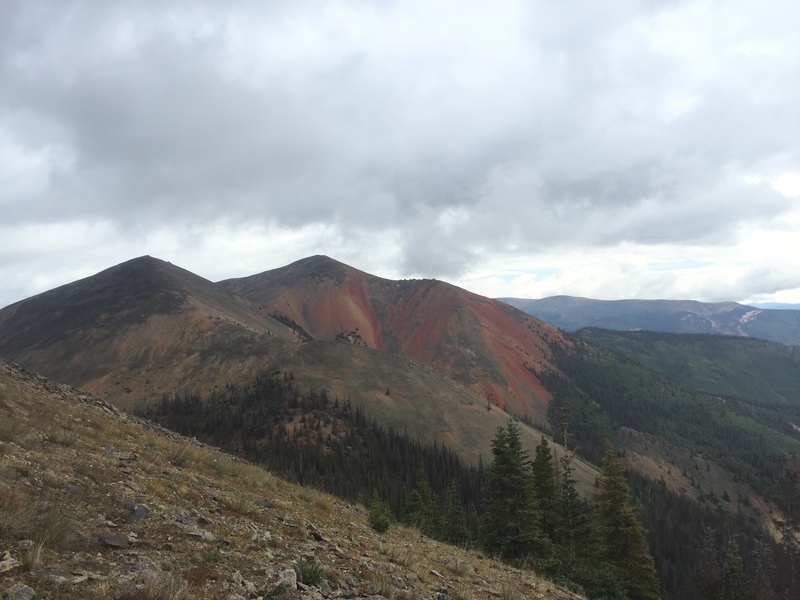 The route was inspired by the San Juan Solstice 50 M; the path follows Alpine Gulch (a major north-south drainage into Henson Creek) to a pass between Red Mountain and a peak known as 13,881 (many unnamed peaks are only denoted by their elevations). From the pass, which has an elevation of approximately 11,770 ft, the route climbs and then follows a ridge line to 13,811. It is a scrabble of about 700 feet to the smooth summit of 13,881 – it is also incredibly peaceful and isolate. No trail, no people! From the summit of 13,881 the route is a backtrack with a side scrabble up another prominent peak, Grassy Mountain (elevation 12,821 ft). The weather forecast for September 5, called for significant rainfall starting at about 11 am. There had been plenty of rain the previous couple of days in the area, and when I started the run at 6:30 am it only took 1 mile or so before I was soaked to the bone from the dew provided by the heavy growth of the underbrush. Compared to the SJS50 in late June, the Alpine Gulch Trail was barely passable (or even visible!) due to the summer growth. The stream was running with less volume than in June, but the 7 crossing required during the climb still meant wadding in ankle deep water. About 2 miles up Alpine Gulch the drainage splits into an East and West Fork; the East Fork leads to the pass and peaks beyond. Somewhere around 10,000 ft elevation, there is no sign of the trail, but a runner knows that you must keep heading upward. There are a number of mines (mostly small spoil mounds) along the valley that I did not notice during the SJS50. The stream meanders through the spoils, and obviously collects discharge from the old underground workings. 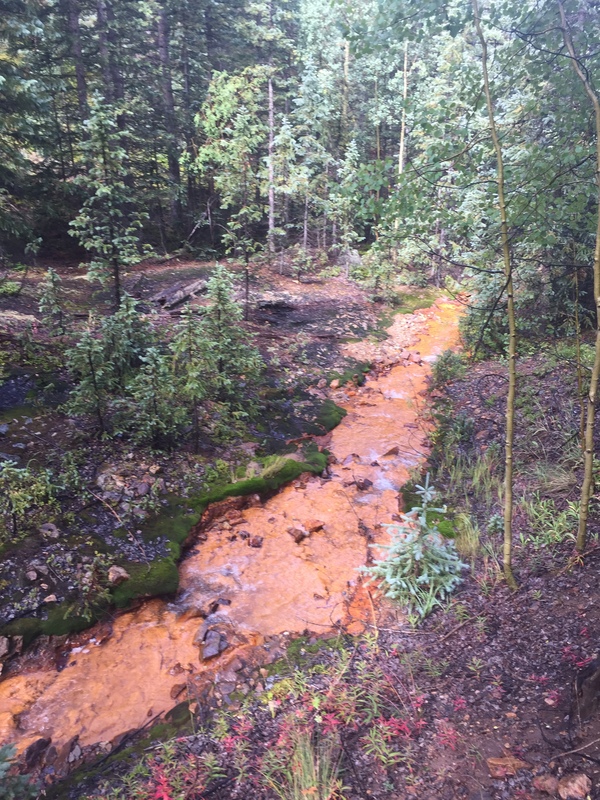 The water is crystal clear, but the channel has a thick orange mud coating. East Fork of Alpine Gulch. The water is clear, but there is a mud that probably represents iron minerals that flow out of the old underground workings of mines in the area. Above 11,000 feet elevation it is possible to rediscover the trail, and running is easier (actually that is a mis-statement, running is never easy above 11,000 ft). Clouds begin to roll in, and I fear that storm is due any moment (my fear is for lightning, not rain – I can get no wetter…). A mist descends, and lowers the visibility, but no heavy showers or hail. I pass the saddle, which serves as the first aid station in the SJS50 at 1 hr and 40 minutes (4.8 miles). I had hoped for views, but all horizons look gray and wet. A view of Red Mountain, home of some of the richest mines near Lake City. The view is from the ridge line on 13,881 looking due north. 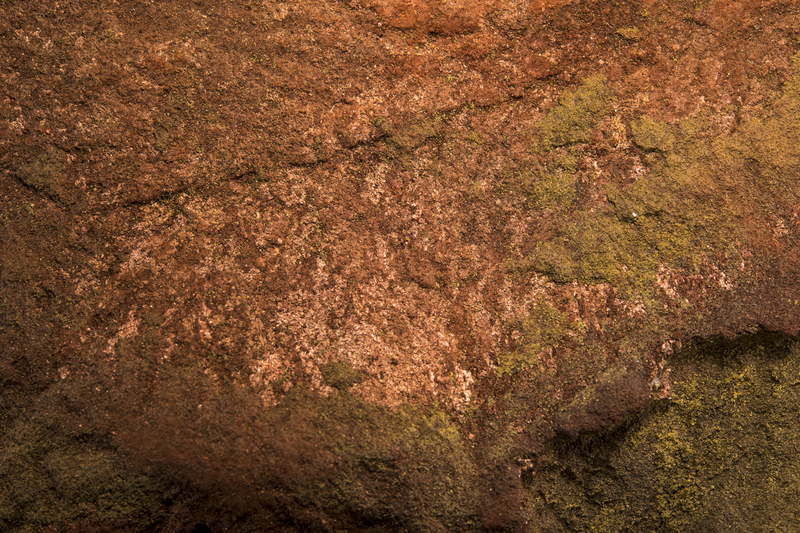 The iron stains are eponymous hero – signaling that hydrothermal solutions surged through the collapsed Lake City Caldera 5-8 million years ago. 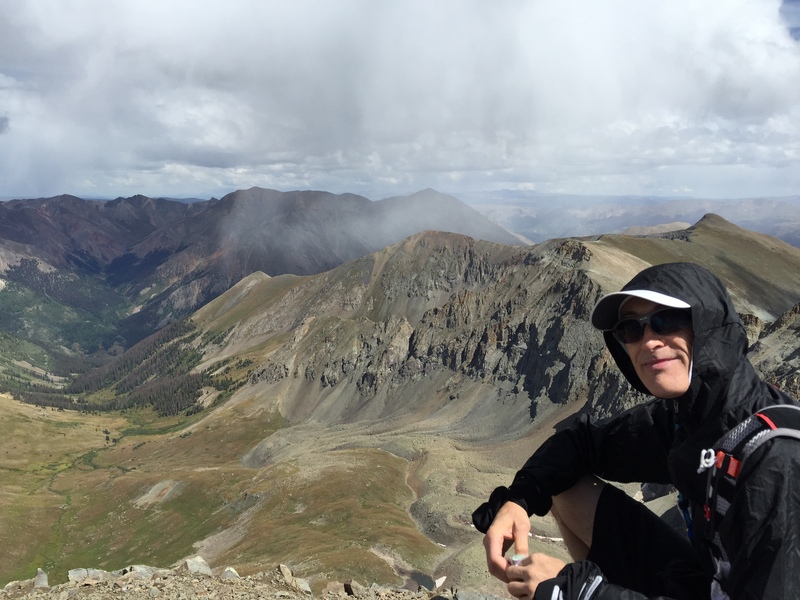 The mists – or clouds – temporarily rose about 13,000 ft as I climbed up the ridge to peak 13,881. Still no great views, but I could at least gaze upon Red Mountain to the north (and know that Lake City was only a couple of thousand feet below). The picture above is taken about 5.5 miles into the run, and sense of isolation settles on me with great comfort. The clouds soon dropped to surround me with a thick gray curtain. 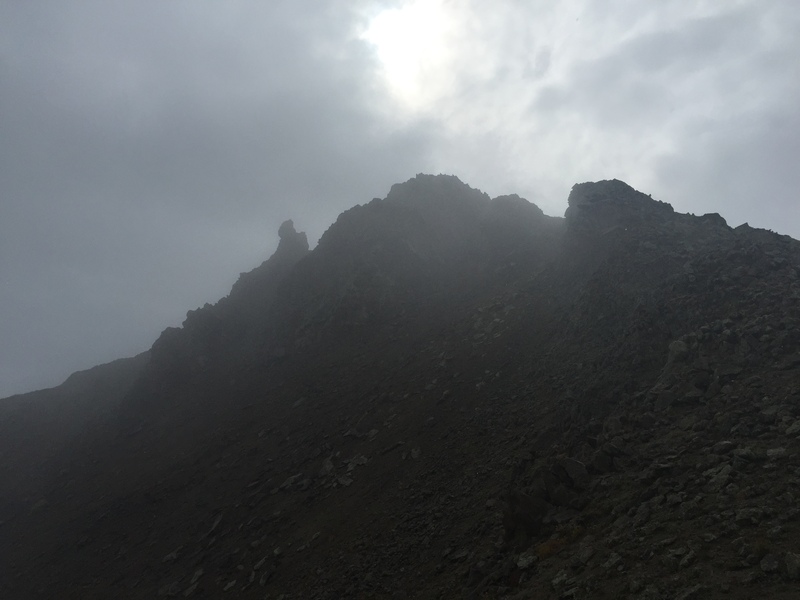 It remained with me even as I summited 13,881 – I think the visibility was less than 20 yards. I quickly retraced the path way back, and headed for Grassy Mountain (or where I thought the peak was!). 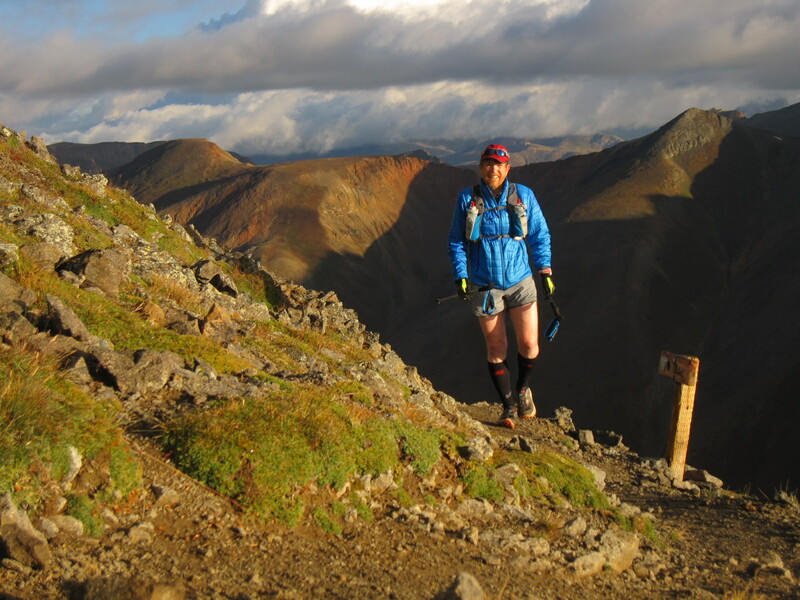 This is beautiful running county – all above timberline, and alpine grasses. A few hundred ft below the summit of Grassy Mountain. The clouds shrouded the peak, giving the sense that perhaps this was Mt. Doom in Mordor. 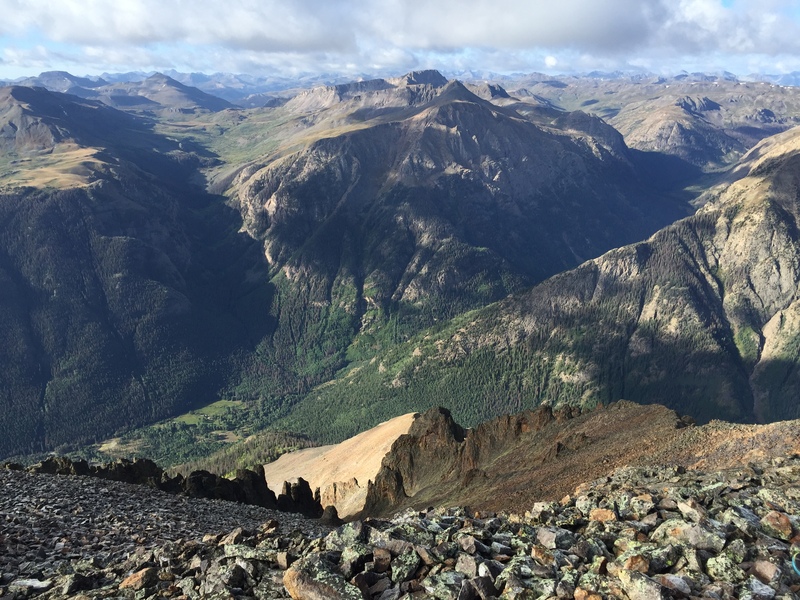 I climbed up Grassy Mountain – sort of strange name for a peak in the San Juans. On the flanks are alpine grasses, but in the clouds I only see crags. When I reached the summit I was surprised to find a peak register. I opened the log, and saw only 4 people had signed the register in the last 3 years. I guess Grassy Mountain is not on the beaten path. I was now at mile 9.2, and decided to eat some food before running back down the Gulch. I was rewarded with a temporary rise of the cloud, and captured a panorama of 13,811 and the ridge line defining its northern shoulder. 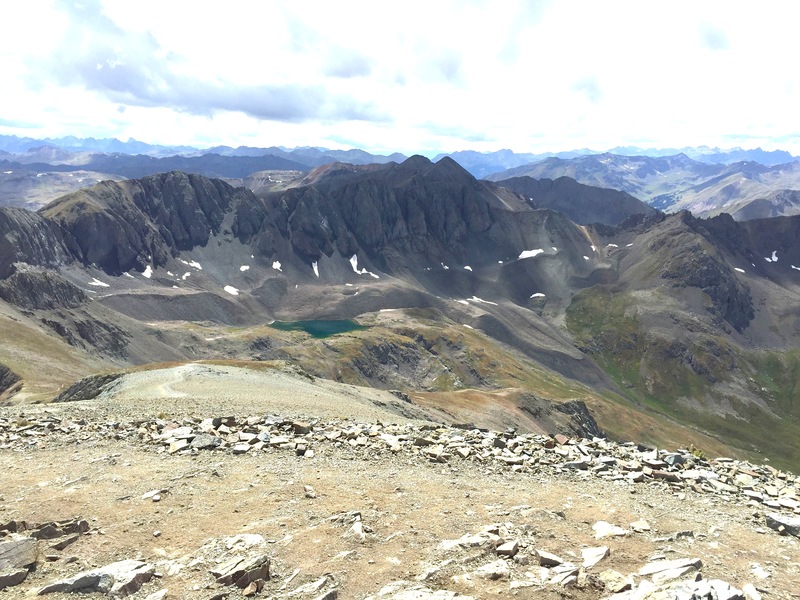 Panorama from the crest of Grassy Mountain towards peak 13881 (on the left hand side of the photo). The distance from Grassy to 13,881 is about 1.3 miles as the crow flies. The descent back to the Alpine Gulch Trailhead was uneventful; for day one the mileage was just over 16 miles, and the elevation gain was 4,200 ft. I finished in 5hrs and 50 minutes, assuring that I could brag about a trail run with an average pace of under 3 miles and hour…but that would seem fast compared to day II of the Heart of the Caldera! The second day I had advertised through the Mountain Trail Series, an excellent resource for trail runners in Northern New Mexico. I had proposed a run to the top of 3 14ers in the western edge of Lake city Caldera: Red Cloud (14,041 ft), Sunshine (14,006 ft) and Handies (14,058 ft). The trails connecting these peaks are straight forward, and is quite “runnable” although there is major elevation gain along the 24 mile route. Labor Day weekend is a great time for a trail run – but that also means there are LOTS of trail runs, and the interest in what I call the “Figure 8 of fun” was mostly cheer leading. We started and finished the run at Silver Creek Trailhead, which is located in the center of the “figure 8”. Silver Creek TH is at an elevation of 10,400′; we started the run at 5:45 am on September 6, and quickly run (an exaggeration…) up the first couple of miles of Silver Creek in the dark. The temperature at the start was 34 degrees, which is pretty nice when it is dry and there is no wind. We pass about 10 groups of hikers that had an even earlier start on the day than we did. Silver Creek gets its name from the stain it leaves on the rock – not from any great silver deposits in the surrounding peaks. There are some molybdenum deposits in the valley, and these deposits carry some easily dissolved aluminum which precipitates out on the stream boulders giving them the look of the moon when it is full. 1000 ft below the summit of Red Cloud. The sun has risen in the east (the left hand side of the photograph), and there is a fresh dusting of snow barely visible on the summit. This photo reminded me very much of my last visit to Red Cloud with my good friend Dave Bunk, who made his first 14er summit. He was carrying an old school backpack, and plowed up the steep trail with grit and determination! There is nothing difficult about the trail to Red Cloud, but the last mile is quite steep, and our pace slows to 40 minutes per mile. The previous days clouds had dusted the top of Red Cloud with snow, and the trail rocks was coated with ice. Hoka running shoes and ice are a comical mix, but with care and luck, we arrived at the summit in 1 hr 50 minutes (the distance is 4.5 miles). Dave Dogruel at the summit of Red Cloud at about 7:30 am. View is to the north. It is only 1.5 miles running along a ridge to the south to reach Sunshine Peak. However, the icy conditions meant it was a bit of slog. 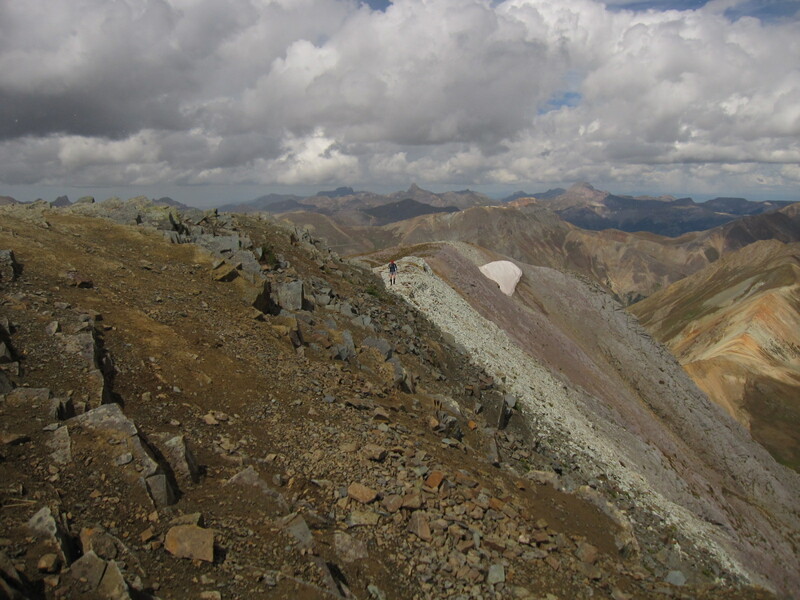 Sunshine peak is the lowest of Colorado’s 14ers, and the prominence along the ridge line is only 450 feet. However, this in no way diminishes Sunshine, and in fact, is one my very favorite peaks. Once a runner arrives at Sunshine the views in all directions are stunning; but most hikers and runners just stop at the summit – a little further journey, perhaps 30 yards, leads to a most amazing view. Sunshine towers above the Valley of the Lake Fork of the Gunnison River. There is a nearly vertical drop of 4500 feet! View from the summit of Sunshine into the Valley of the Lake Fork of the Gunnison. The path of green in the left-center of the photo is the former sight of the mining town of Sherman – only 1.1 miles away as the crow flies, but 4500′ lower in elevation! The view down to Lake Fork of the Gunnison River spies a flats at the intersection of two drainages. It is green from vegetation, but even from this elevation, it looks like a great place for flash floods. Never to be deterred by geologic disasters, miners built on that exact spot when a rich silver deposit was discovered in 1876. 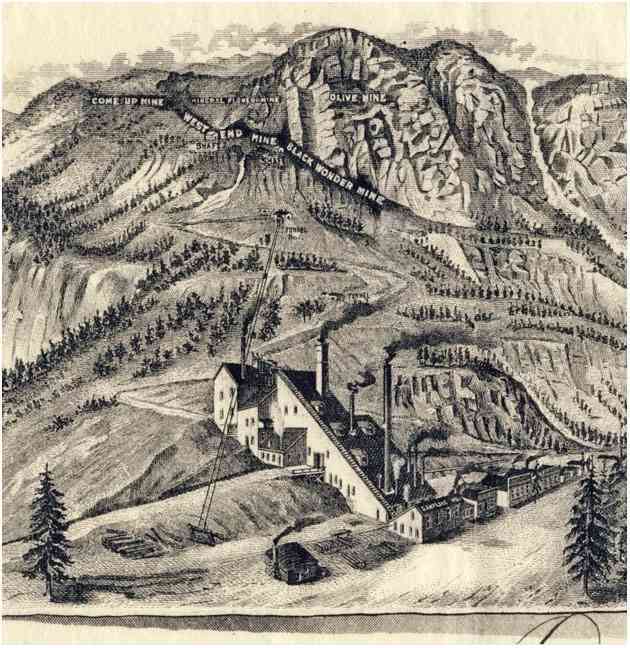 The Black Wonder Mine and Mill, from a stock certificate issued in the late 1890s. The mine was high up on the ridge, and ore was transported down via a tram to the mill built on the river. There is not much to be seen at Sherman today, but I did spend time in my youth picking over the dumps of the Black Wonder. I don’t have anything to show for it today, but the view from Sunshine floods my mind with happy memories. 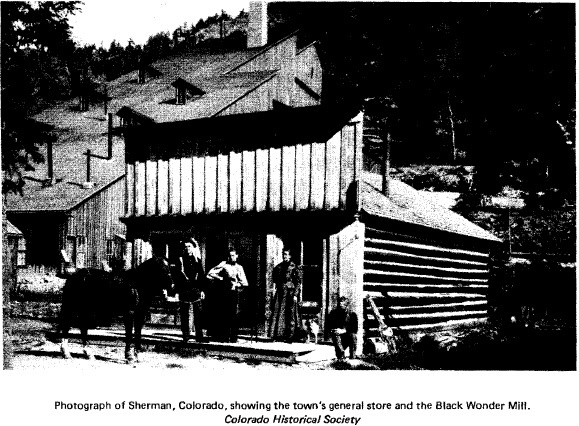 Photograph of the Black Wonder Mill, and the general store next door in the late 19th century. It was totally destroyed in a flood shortly after this photo. Today this is the site of an aid station in the Hardrock 100. The total distance from the TH to Sunshine is 6 miles, and we made the summit in just under 3 hours. The views in all directions are wonderful, but we see lots of clouds building, and know that time is short to assure a safe Handies summit. A view from Sunshine to the northeast. The highest ridge-peak in the center of the photograph is peak 13,881. The right of 13,881 is a lower peak in the very center of the photograph, which is Grassy Mountain. Day I of the Heart of the Caldera meets Day II. The sun has melted the ice on the rocks, and the descent back to the trailhead is pretty fast. We retrace our steeps are reclimb Red Cloud. One of my favorite views is to the west, and looking across the southern fork of Silver Creek. Some hikers choose to bush whack down the steep talus, but it is strongly discouraged – both for safety reasons, and also the erosion that it promotes. The picture below shows the steep walls of the valley and the long stringers of rockslides. Looking across the South fork of Silver Creek. 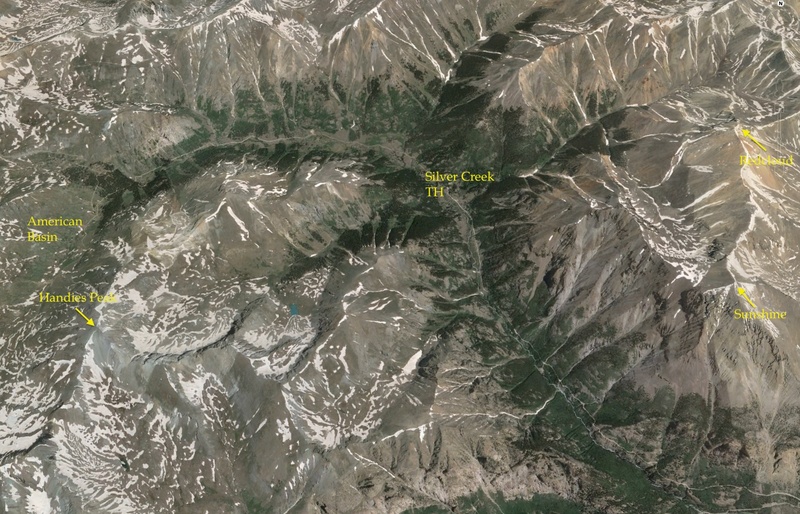 We arrive back at Silver Creek TH in 5 hours, and have the lunch of trail running champions – cold pizza and cheetos. 12 miles into the run, and about 12 to go. Right across from the Silver Creek Trail is the Grizzy Basin Trail, heading west-southwest up Handies. This 4 mile trail is on the Hardrock 100 course, and is a relentless climb that averages 18% grade. 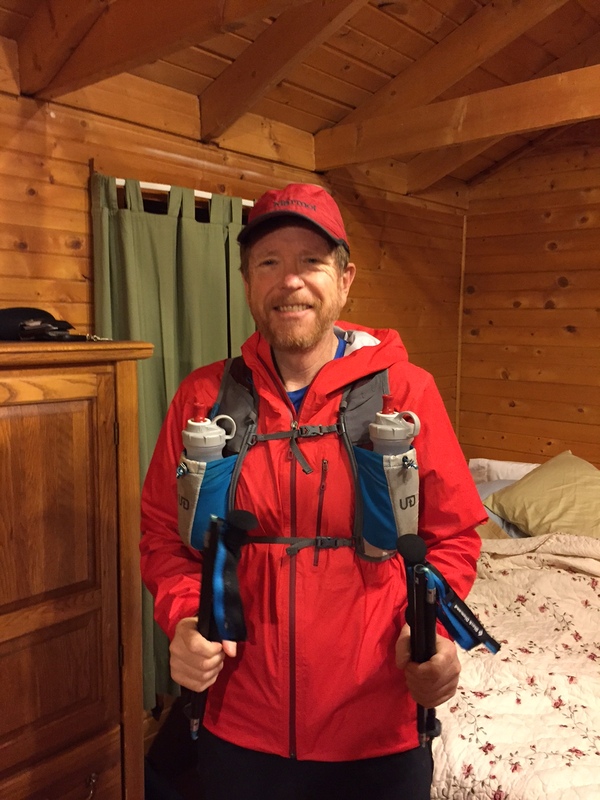 Not really runnable by the likes of me – I am in total awe of my friends like Dave Coblentz and Blake Wood that run this in the Hardrock year after year. Mile 2 on the Grizzly Gulch trail looking up towards the summit of Handies. The trail follows the ridge on the right shoulder of the peak. The climb up Grizzly brings our first taste of real weather. We have hail and wind, intermixed with sunshine. The trail is nearly empty of hikers – most day hikers chose the much shorter route from west side of Handies (which will be our descent route). We arrive at the summit and the wind is spectacular. Handies is a broad summit, and there is little cover from the wind. The summit is 16.5 miles into the run, and we arrive at 7 hrs elapse. Summiting Handies – the last push before getting to the broad top. I have been to the top of Handies many times, but never I have been there with not another hiker/runner in sight. All around is wilderness, and although I can see the road to Cinnamon Pass far below I feel far removed from “civilization”. Many people see marvelous vistas from Handies, but when you ask about the rocks, they shrug and mention that they are all gray and not descript. That is not what I see – I see exploding volcanoes, the mid-Tertiary ignimbrite flare-up that shaped Colorado and New Mexico, and collapsed calderas that would someday host some of the richest mines in America. 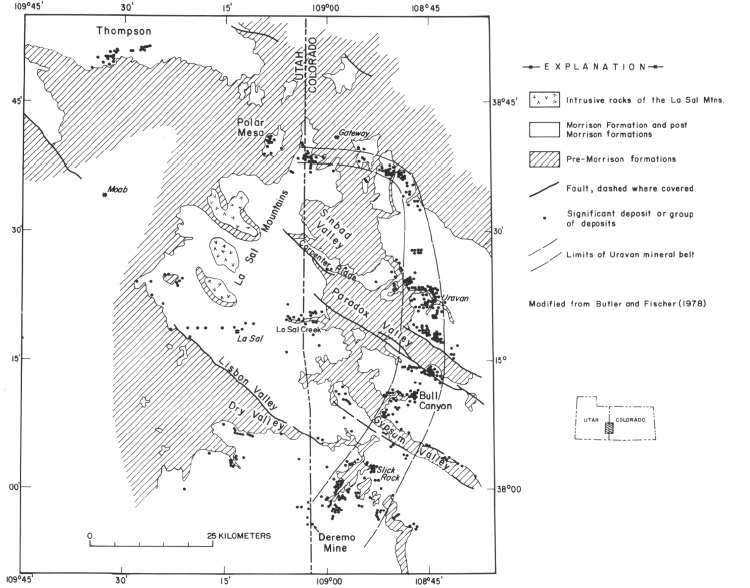 Geology of the area around Handies Peak. Most people see gray nondescript rock, but I see the colors of dozens of volcanic eruptions and the erosion of those rocks. I don’t see grays – I see colors of the different flows and episodes, like a geologic map. the picture above is the geologic map of the area around Handies, and the colors represent rocks that came from different volcanoes. A collage of violence. View back down Grizzly Gulch towards Sunshine – which is behind the vail of moisture falling in the distance. As a crow flies the distance is about 3 miles, but much longer when you run! The descent down Handies is one of the best runs known to trail lovers – about 3 miles of pretty smooth trail, only a few rock glaciers crossing, and a drop of 2500 feet. We run those three miles in about 50 minutes, and fell great coming into the upper TH in American Basin. View from Handies into American Basin. In the center of the photo is Sloan Lake, a cirque basin. Hinsdale Co. RD 30 back to the Silver Creek TH. 4 miles of hard packed rumble…. 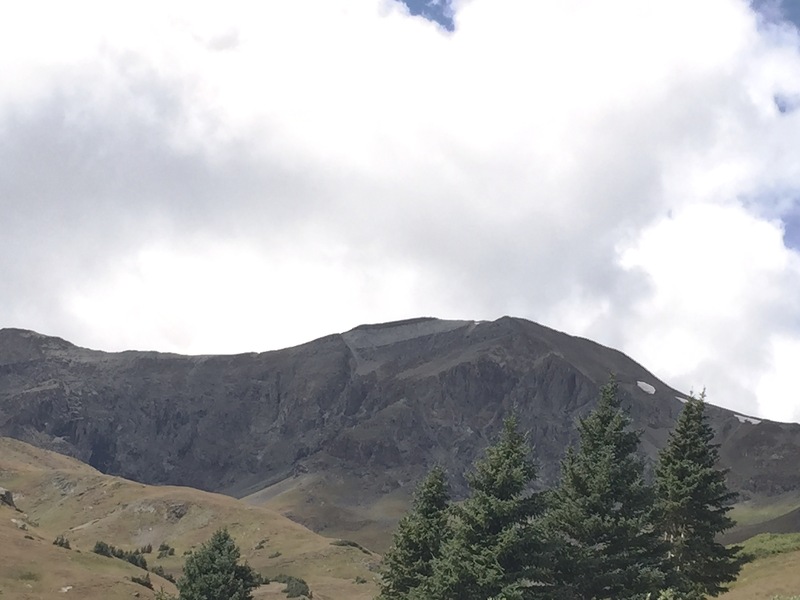 We left the American Basin TH having run 19.5 miles in 8 hrs and 30 minutes – about 30 minutes slower than I expected. We still had 4 miles to go, and realistically, it should have taken us an hour. However, all the chatting – and even more likely the running 16 miles the day before – meant that I was not really able to convince my body to get going. It took an hour and 20 minutes to get to the finish line. The Heart of the Caldera runs were a great adventure. 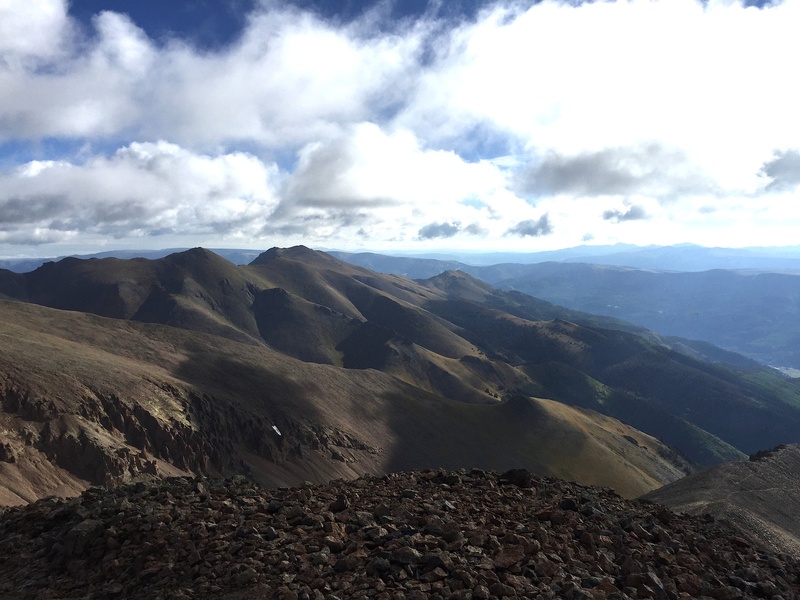 The solitude of the first day was perfectly blended with the challenge and struggle of the climbs of three 14ers on the second. The total distance covered was just under 40 miles, and the elevation gain was about 12,500 feet. But, the benefit of breaking the ultra into two days meant that I got to eat at Bruno’s in Lake City between runs! Bruno’s is a fantastic restaurant run by Frederika & Chef Bruno with some of the best food I have ever eaten. We always go to Bruno’s and it is so unexpected in a remote corner of the San Juans like Lake City, that it brings joy to my heart. The downside of multi-day events – several days of 4 am starts! 4 am starts are the norm. Not sure if this is evolution or illness. The Redcloud-Sunshine-Handies loop is a challenging run – a geologist’s dream to be sure, but still, it is a true physical test. I have many friends from Los Alamos that have done this loop and I am always amazed how fast they can cover this geologic gauntlet. I can’t help but wonder why are my friends and colleagues so much faster? Do I have a poor training regiment? Am I even less coordinated than I appear in everyday conversation? Or, am I genetically predisposed for last place in a trail run? Mostly on a lark I decided to have a genetic analysis based on a blood sample for “athletic genes” a few years ago. Beginning in the 1960s a group of physicians began to look at genes as indicators of human performance – either in the classroom or on the athletic pitch. There have been huge data bases complied that provide a statistical framework to investigate the “nature vs nurture” arguments of why some excel in particular fields. Athletics is one of the richest data basis; there are about 20,000 human genes, and through statistical analysis there are approximately 100 that seem to be related to athletic performance. I say “seems” because although we can understand the rudimentary functions of genes the complex interplay between all the genes is not even poorly understood. However, in the last 4 Olympic Games, every single male medalist in distance running races shared some specific alleles! An allele is a variant form of a gene – inherited – and there can be specific variations that are quite rare. I had analysis done on 30 genes; I had some strange vision that a secret would be unlocked by having this analysis. However, I was mostly unsurprised. I found a genetic makeup that statistically suggests I have a higher BMI and less VO2 max than endurance athletes (I am slightly stocky, and not quite as good a delivering oxygen to my blood as I would hope), Further, I have a “more efficient deposition of fat leading to higher BMI when consuming a high fat diet”, meaning my love for cheese should be reflected in my choice of swim ware. But I also found a statistical cadre with powerful muscles, and a quick recovery time. All my indicators of endurance fell in the vast middle of expected performance – I guess pretty much what I show in every race. What the genetic markers don’t measure is will power. Nor do they measure joy. The lesson learned from this academic excursion – which I am prone to do – is that the mind is the organ that matters. It is complex; but it is our mind that lets us truly experience joy and happiness. For me, trail running unleashes something in my soul (mind), that makes life an adventure.